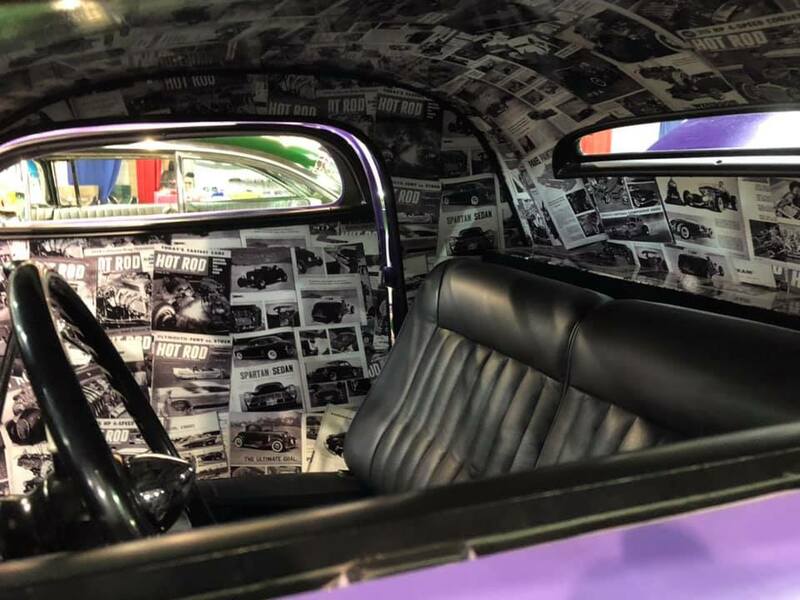 This cabriolet has been done up in a very unique style with a certain retro feel. 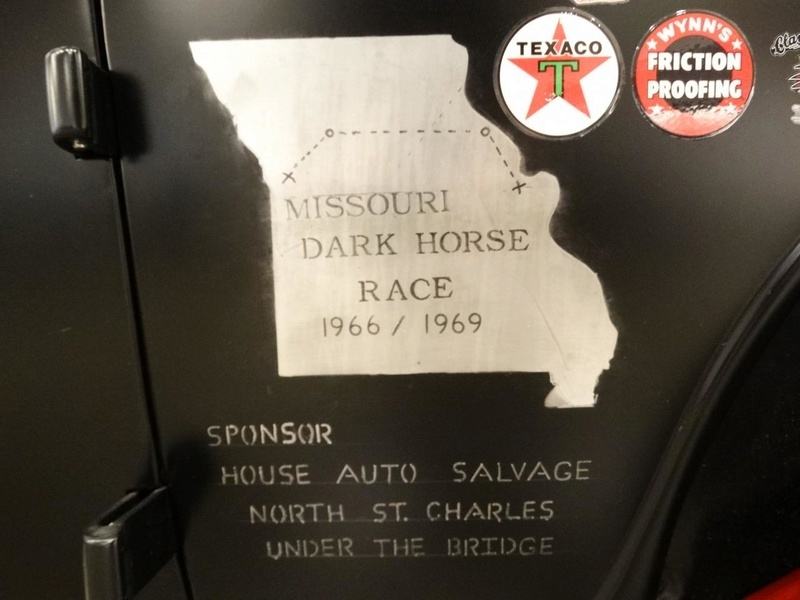 Back in the 1960s this particular car was used in an unsanctioned race referred to as the Missouri Dark Horse Race. 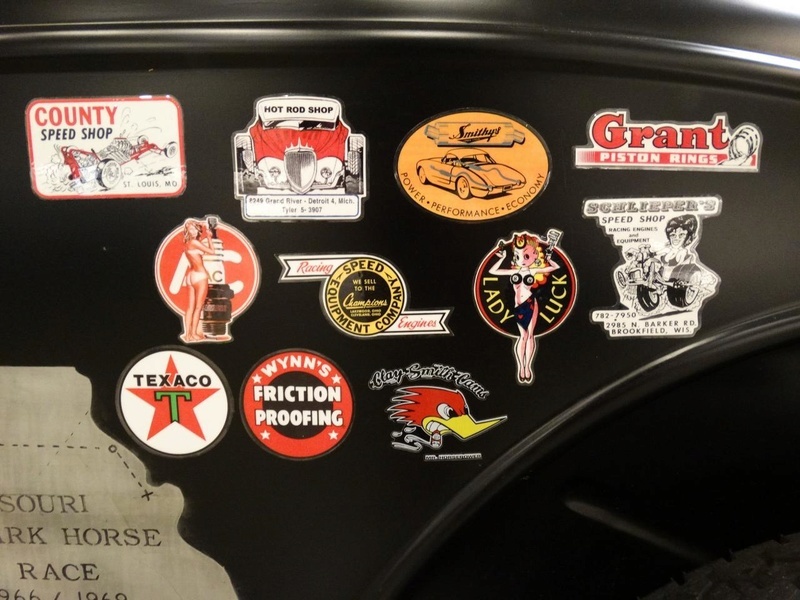 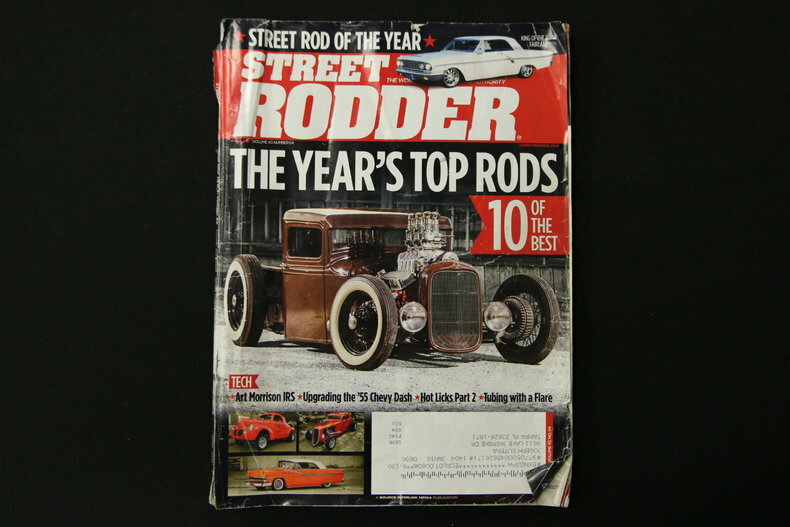 Hot rods of all types would meet up in either St. Louis or Kansas City and race to the other city using a different route each year. 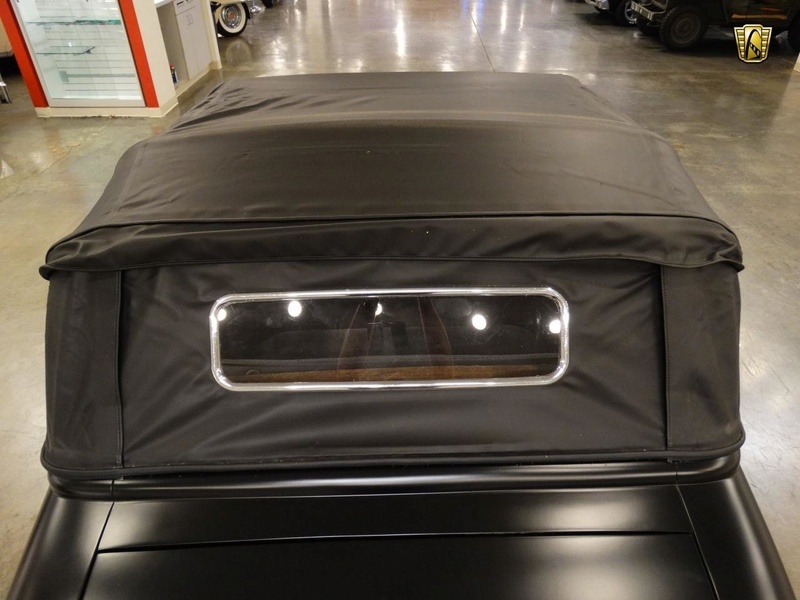 The race would always take place in the middle of the night under the cover of night. 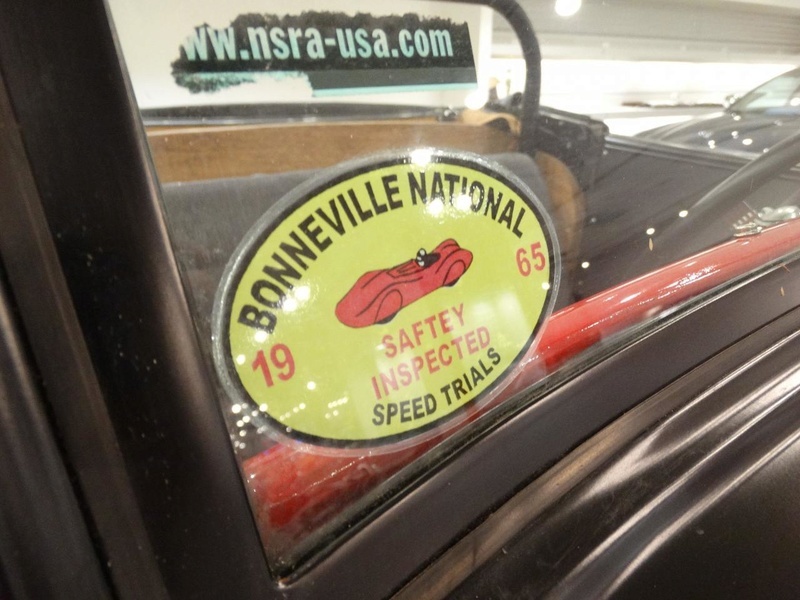 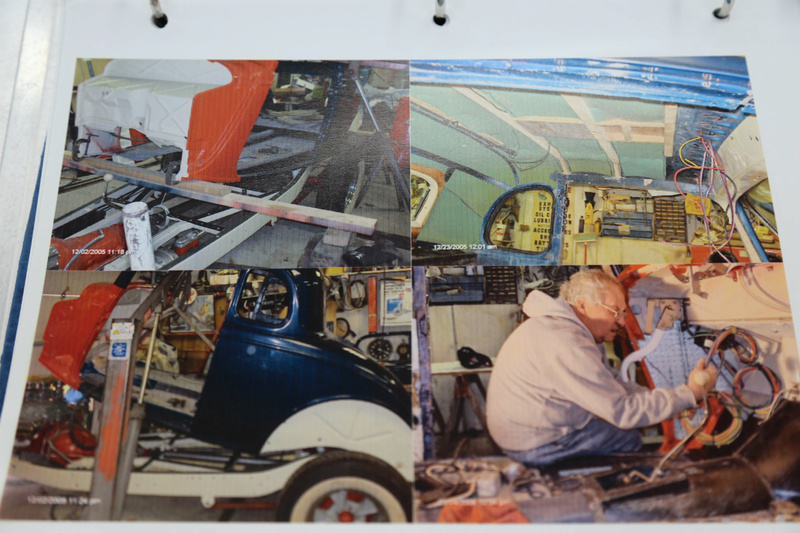 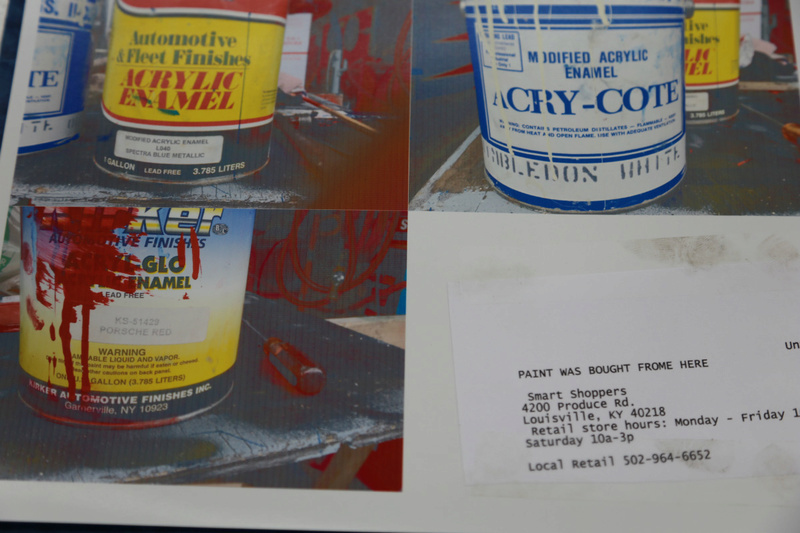 With history as an outlaw racer, it has been restored in a similar style. 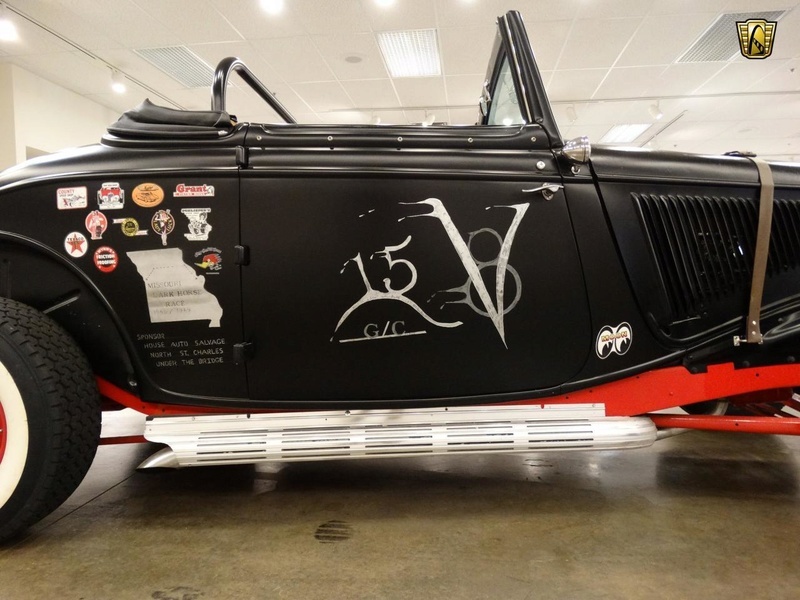 The exterior is finished in a satin black with custom painted racing markings as well as plenty of period style decals. 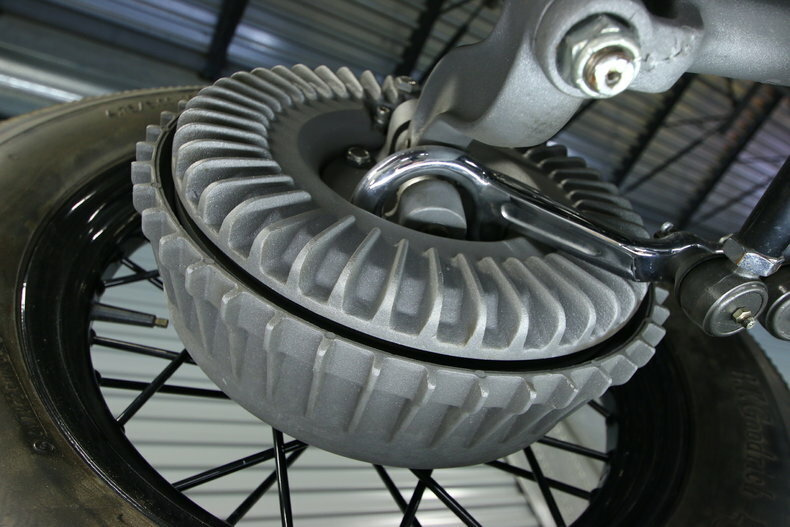 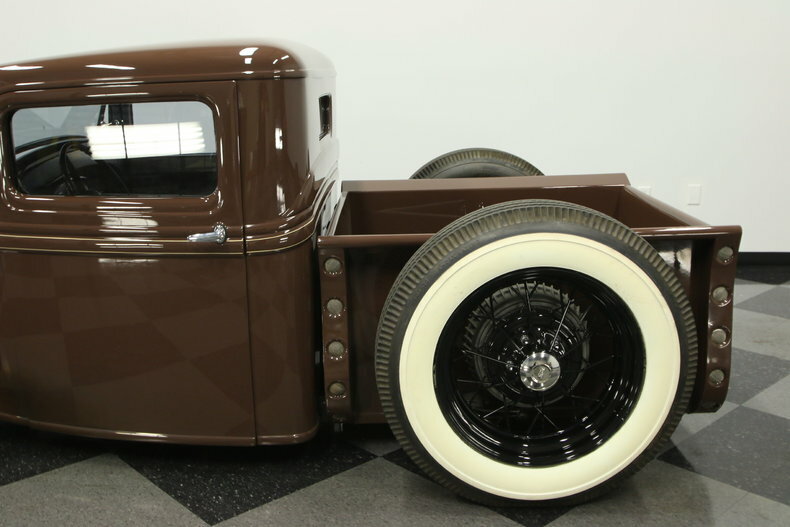 The roaster sits on red steel wheels with hub caps and wide white wall tires. 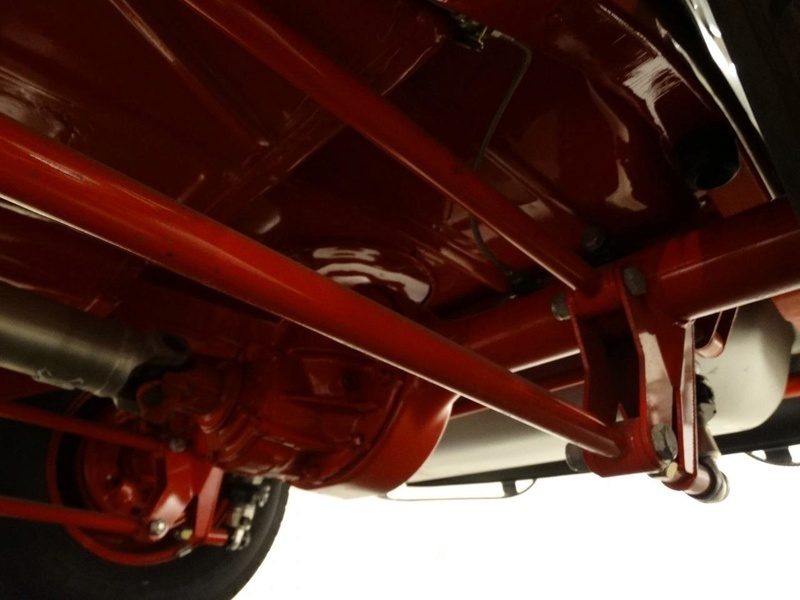 The body sits atop a painted red frame to complete the color scheme and the underside is rather impressive. 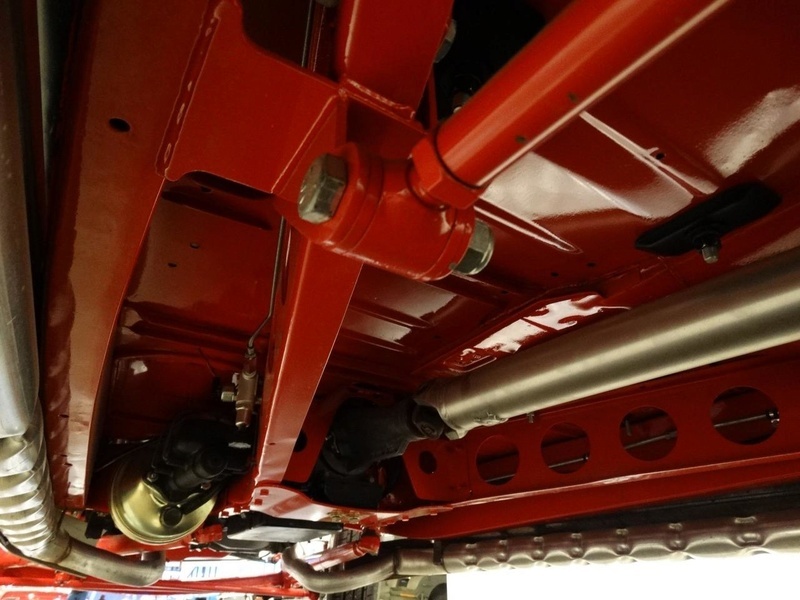 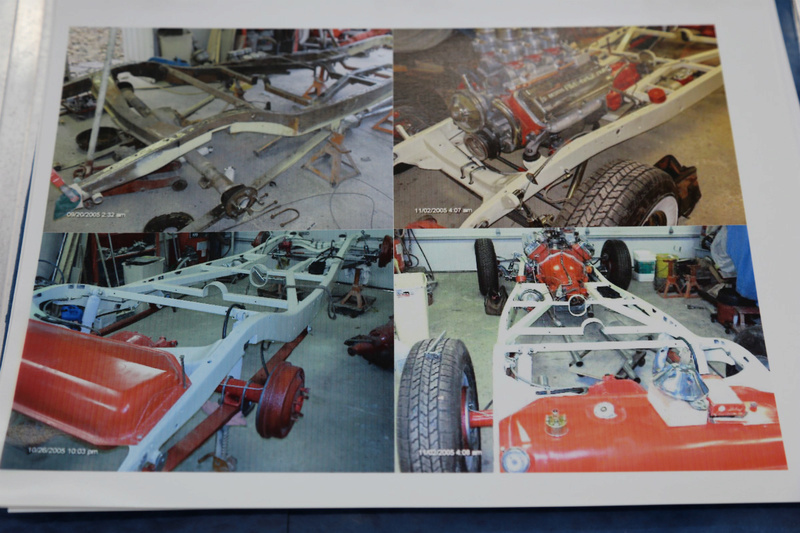 The frame is drilled for lightness and the suspension components are nicely painted as well. 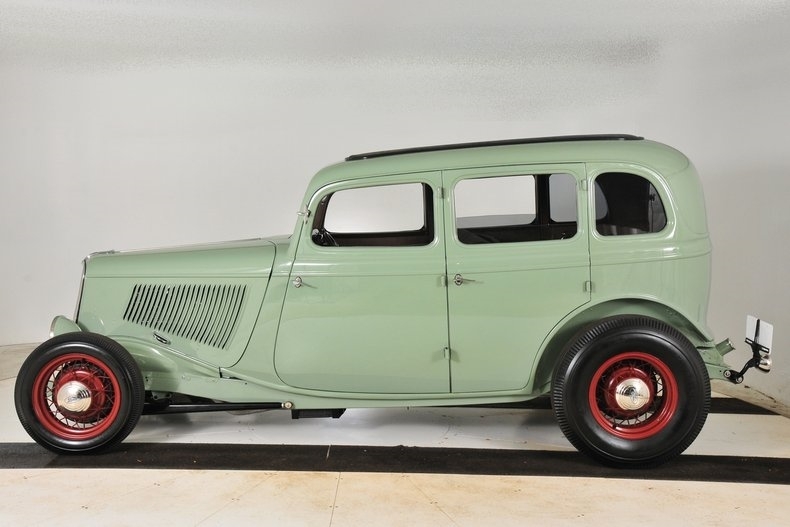 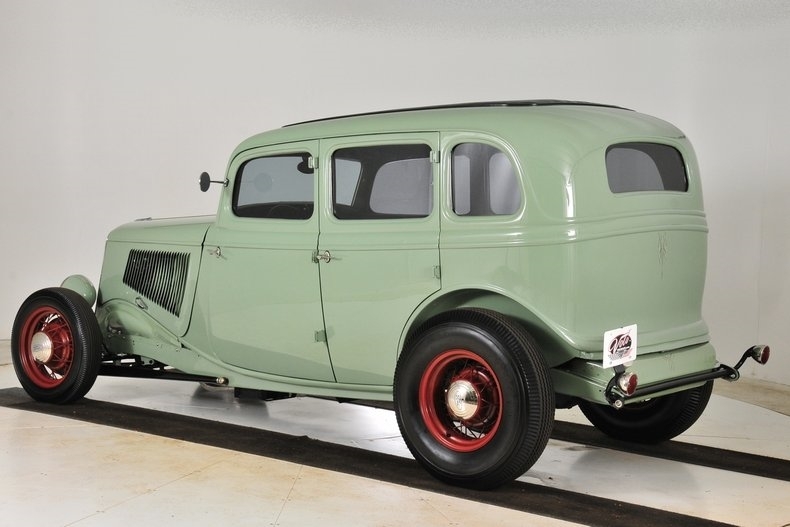 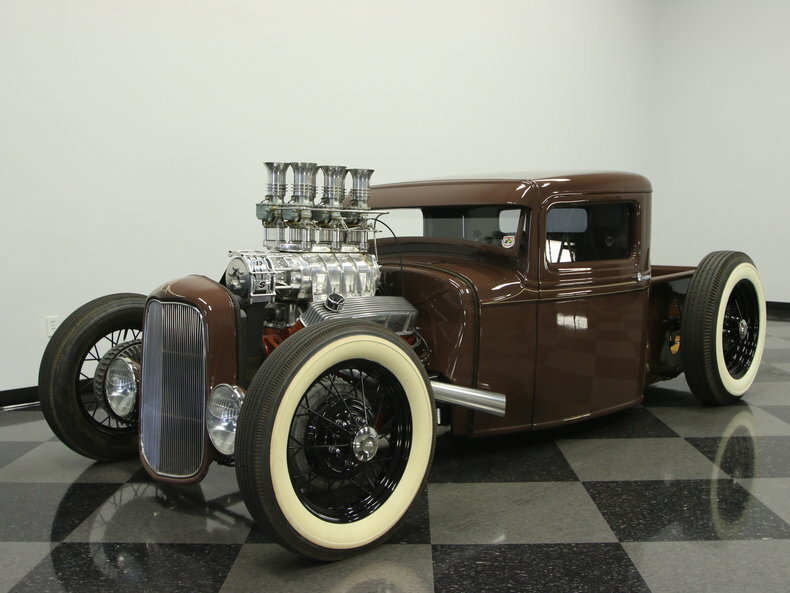 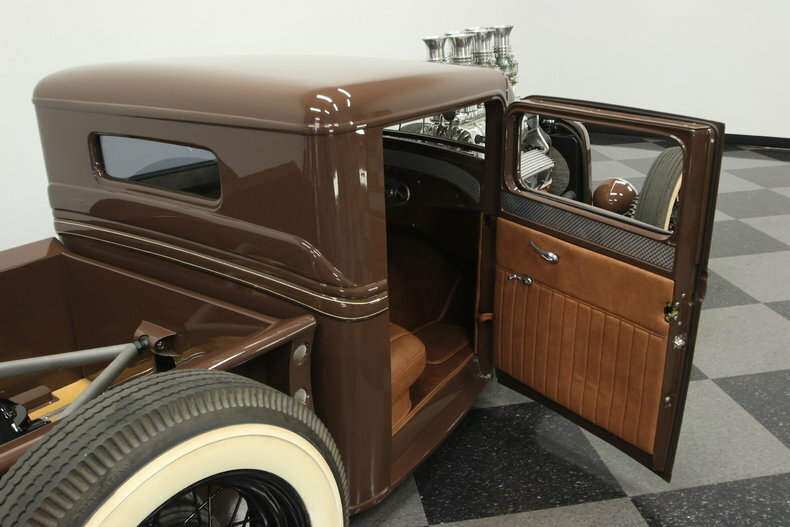 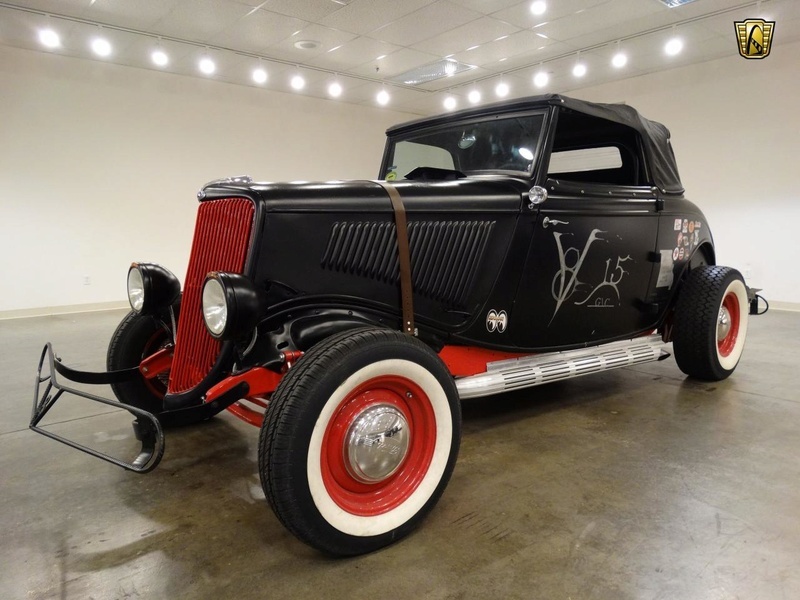 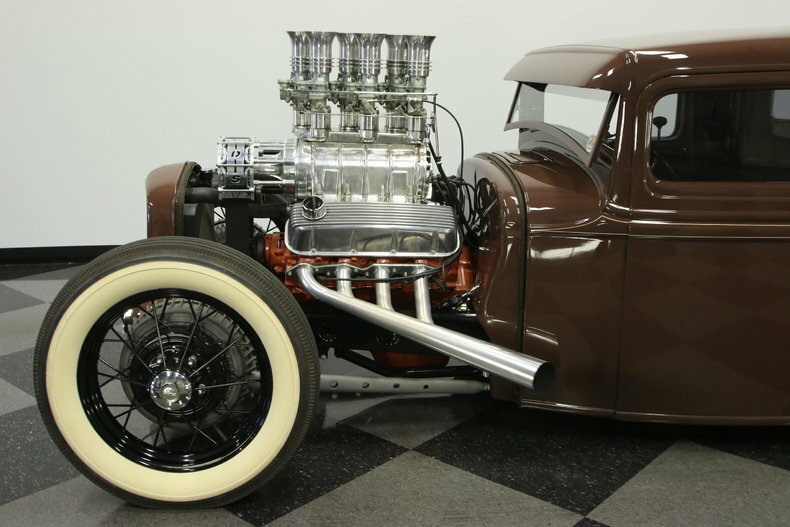 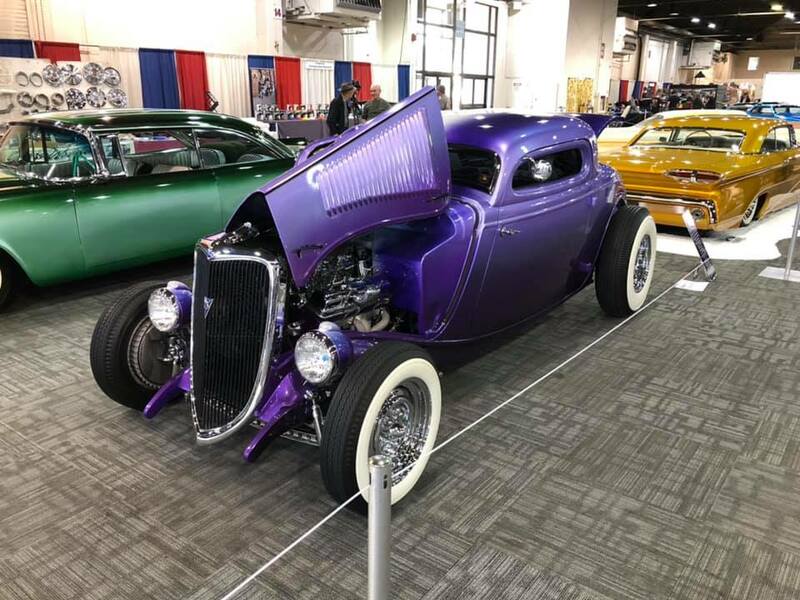 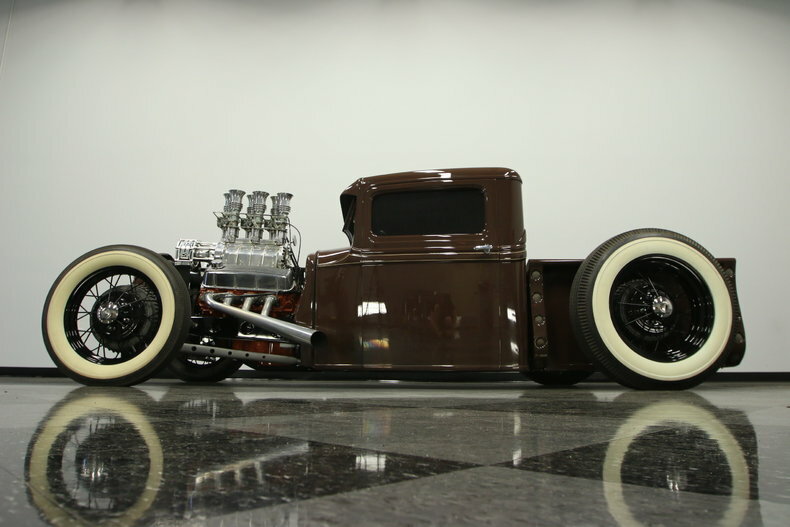 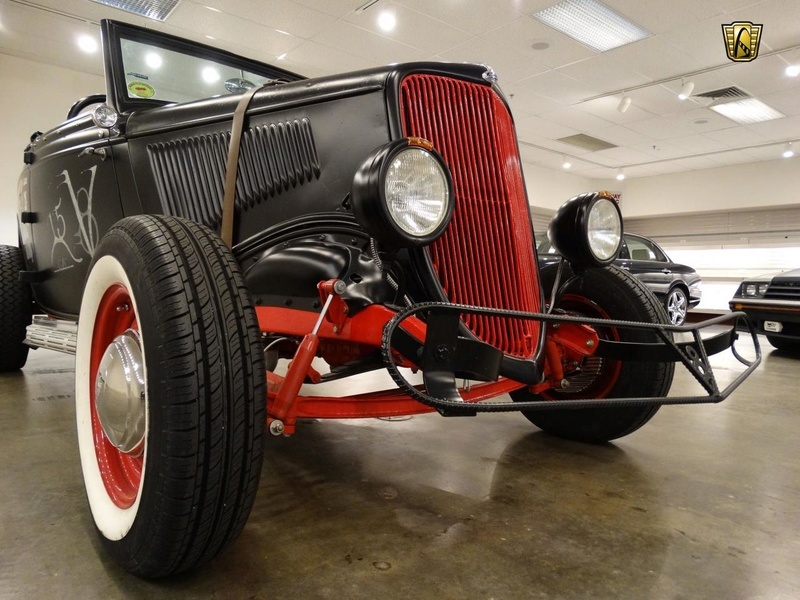 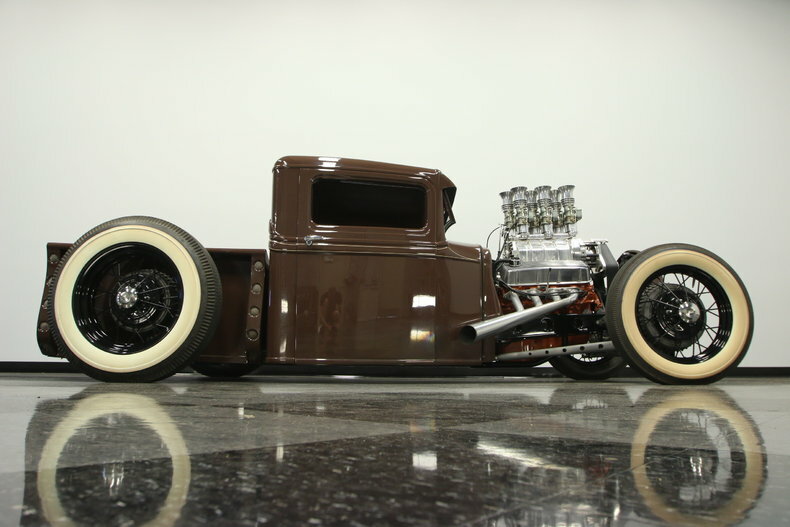 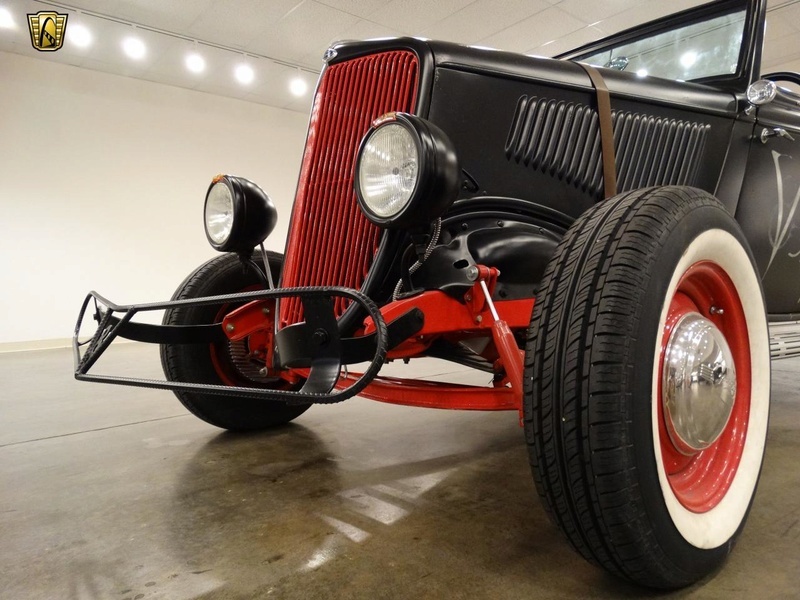 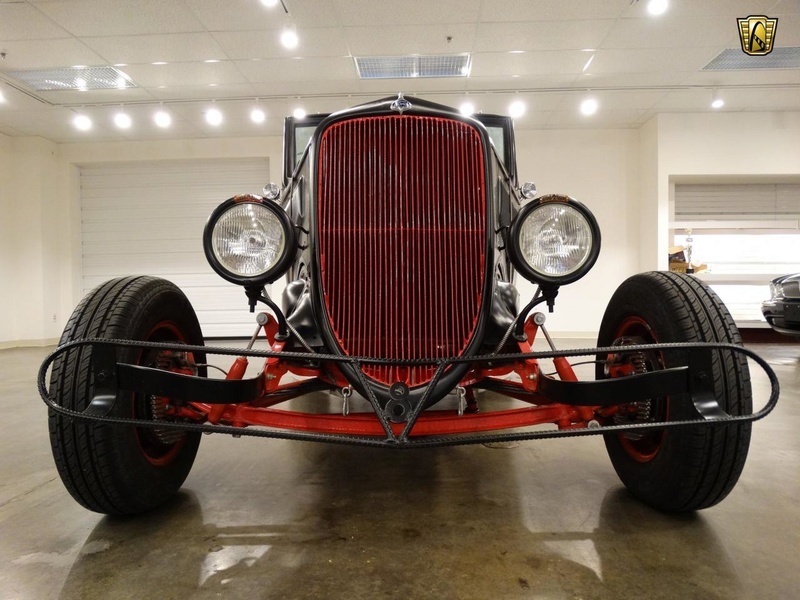 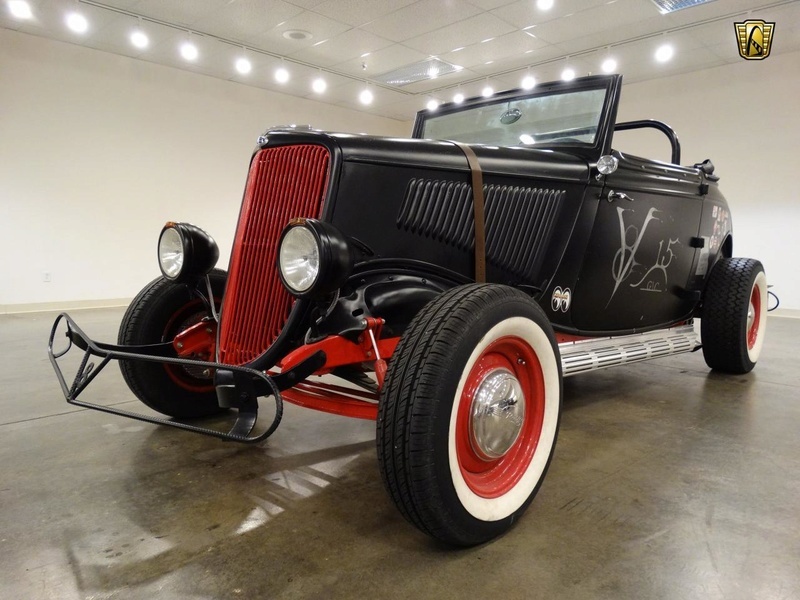 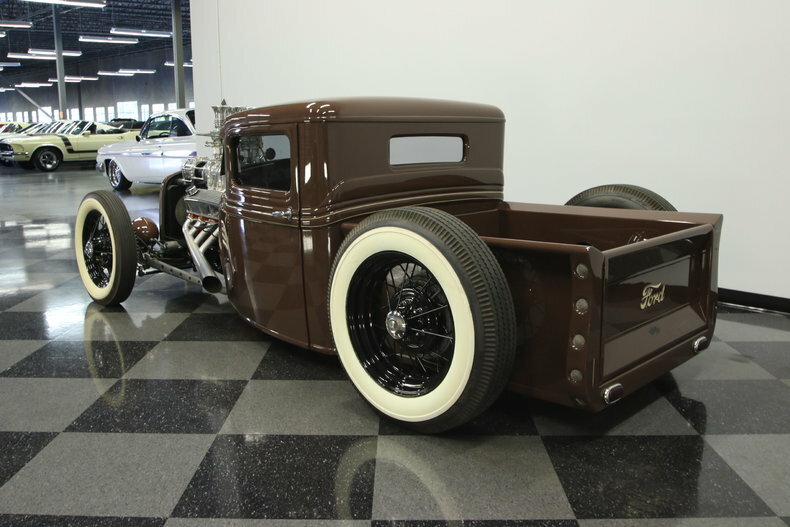 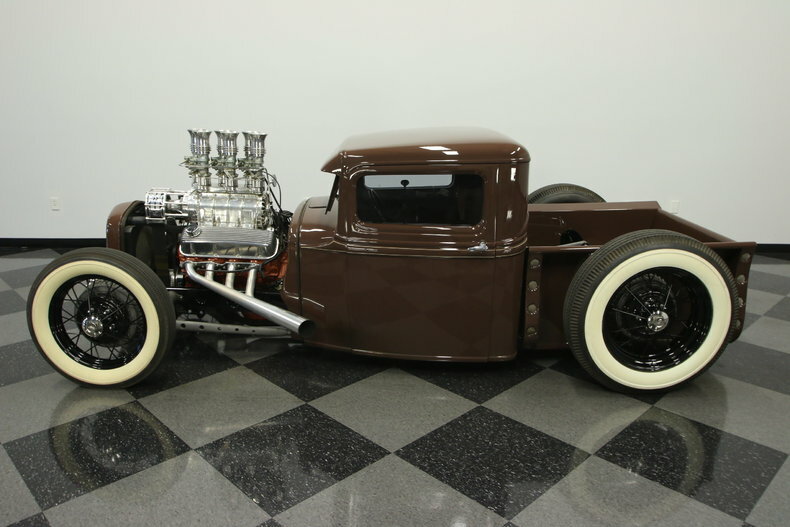 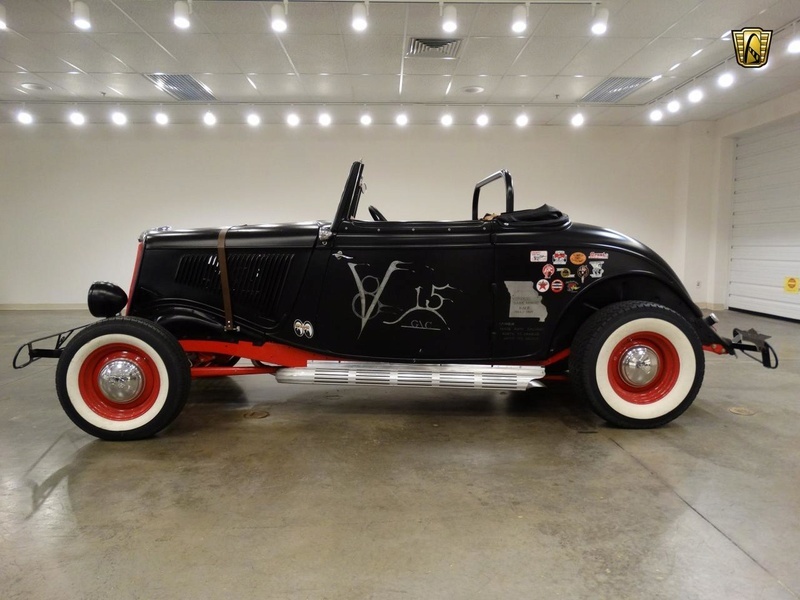 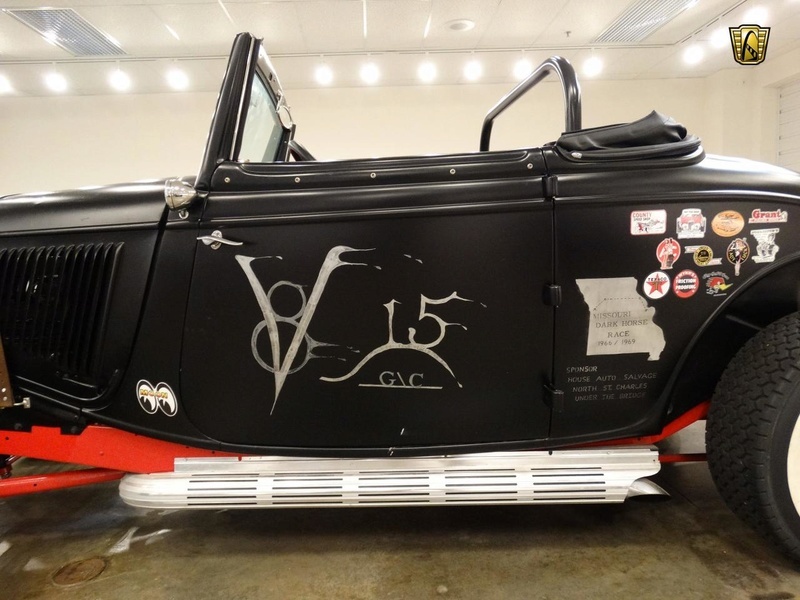 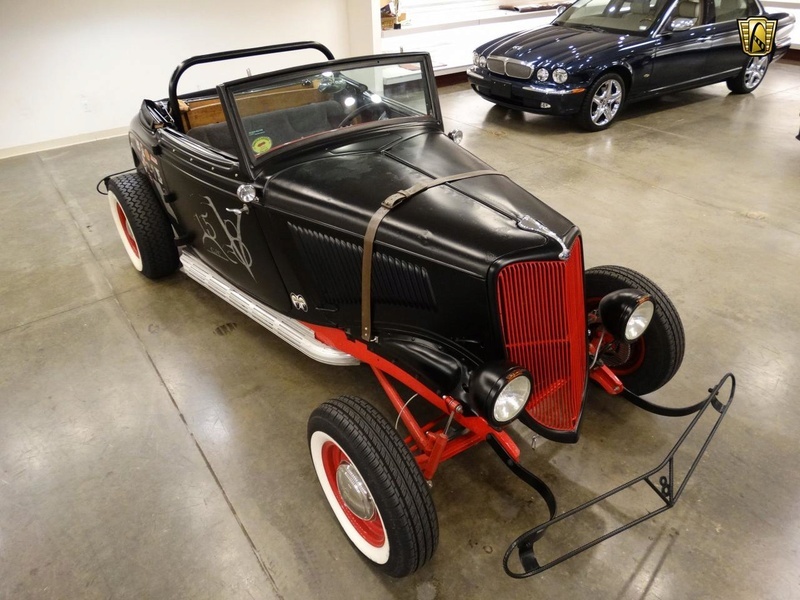 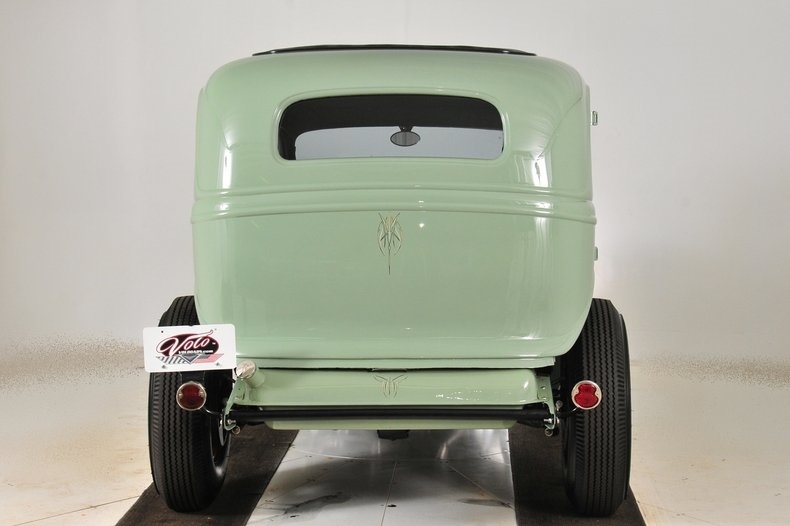 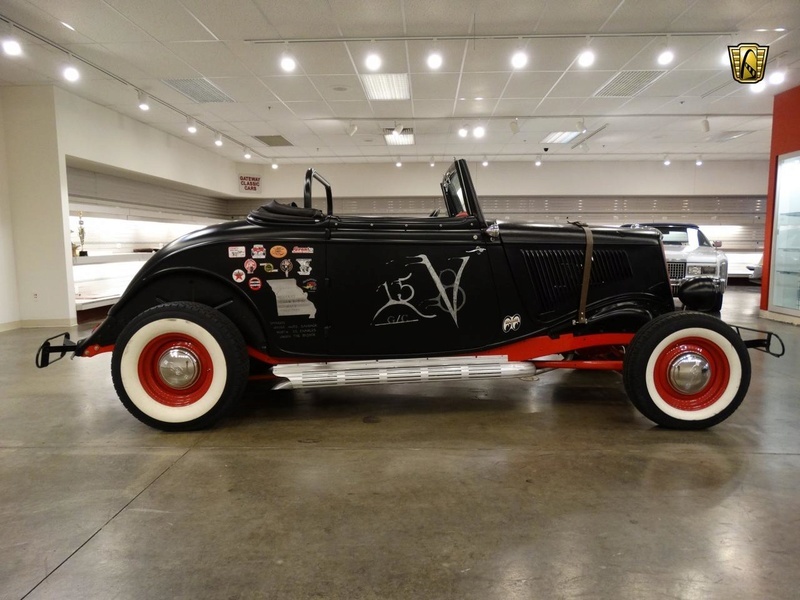 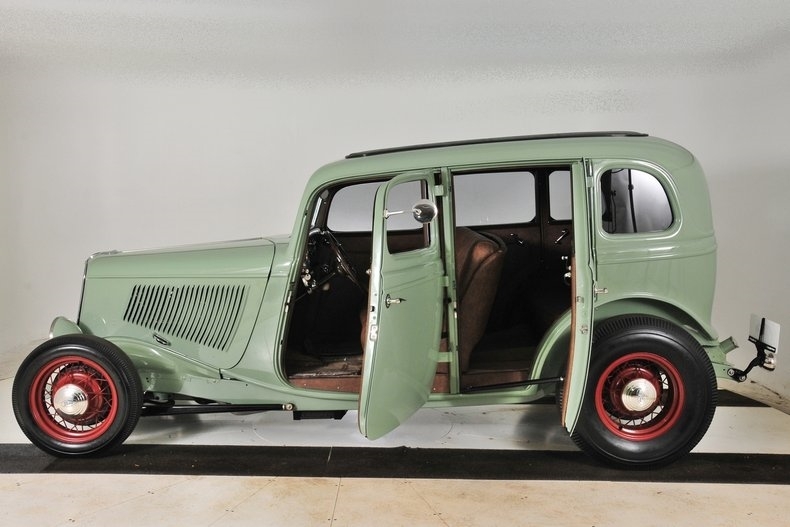 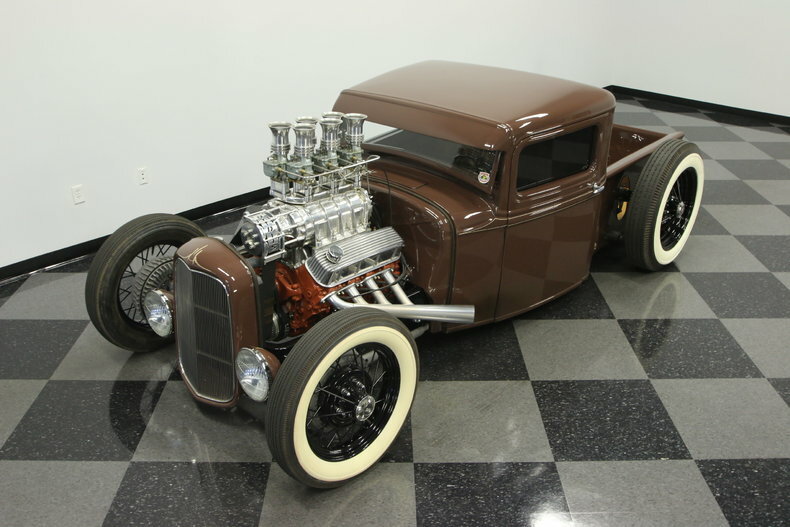 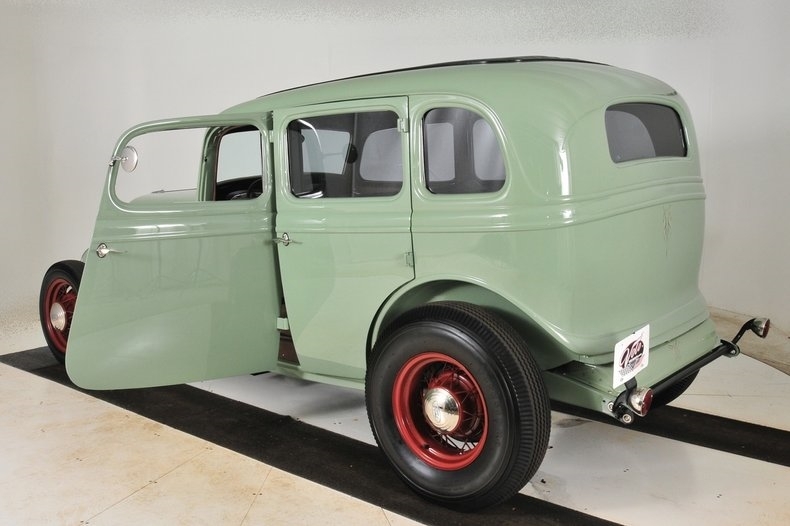 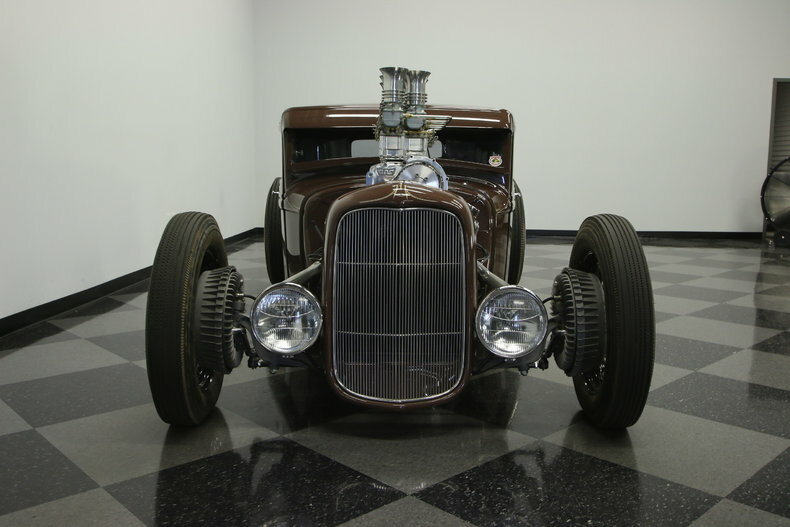 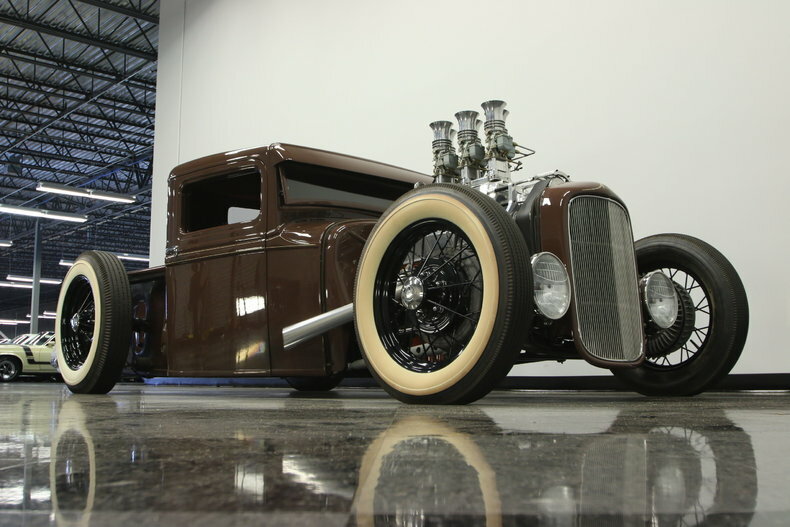 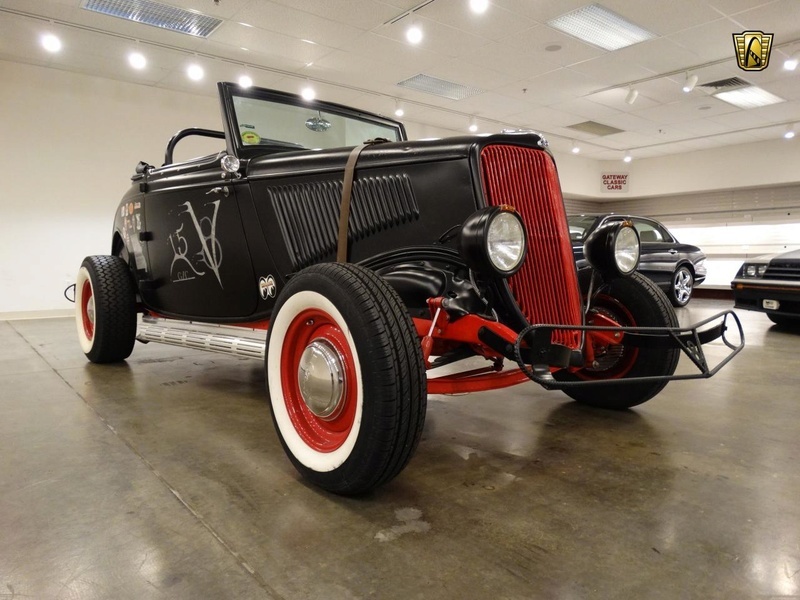 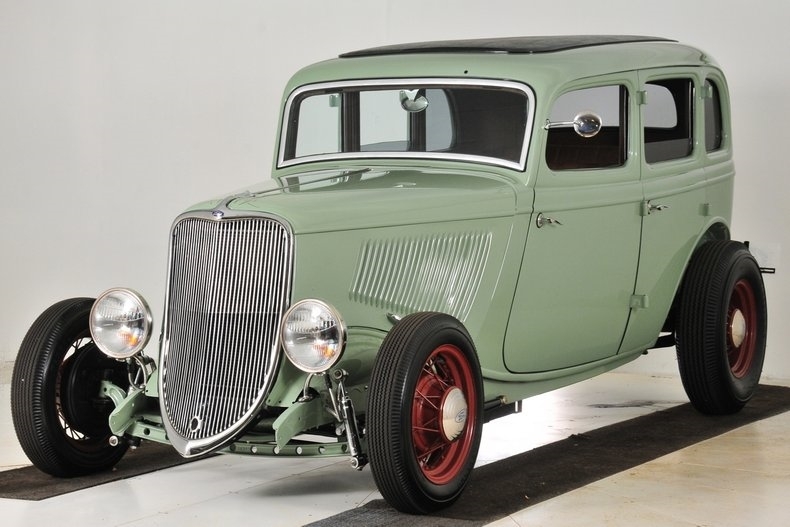 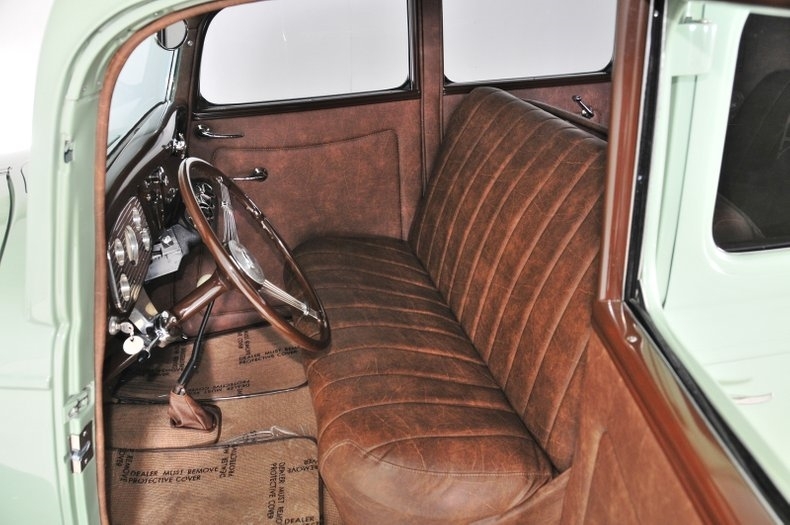 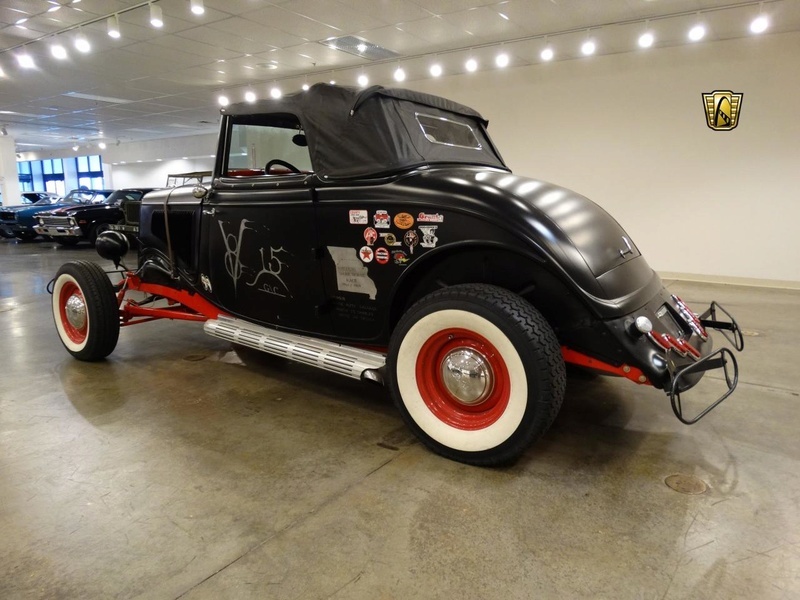 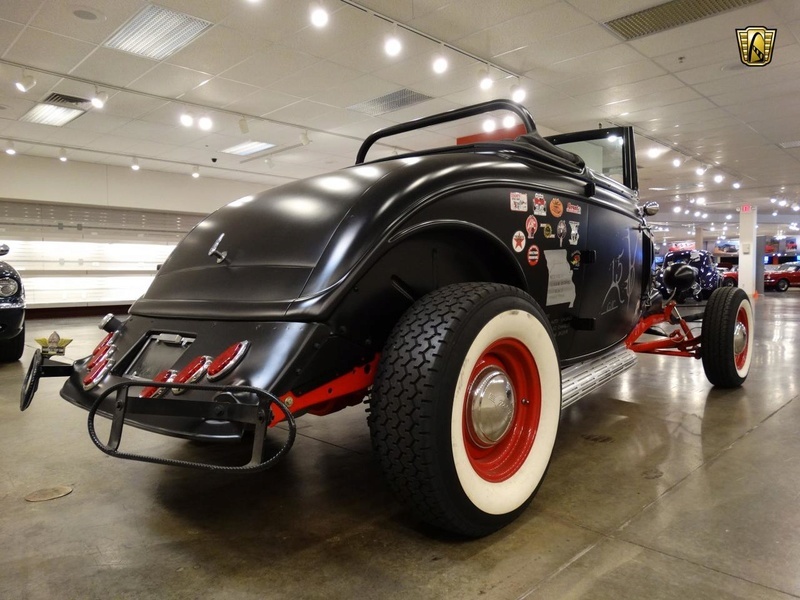 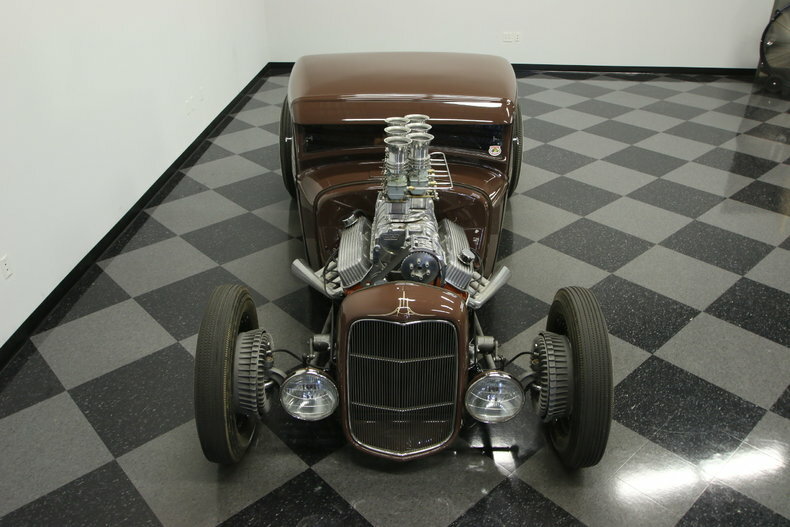 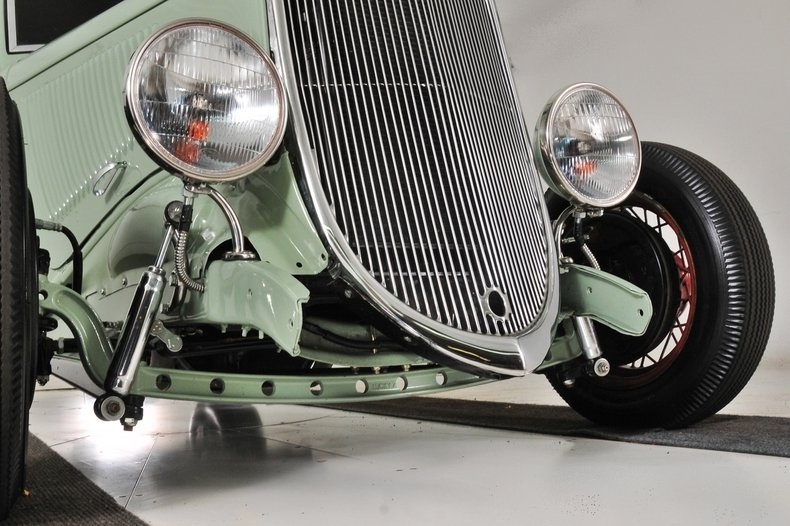 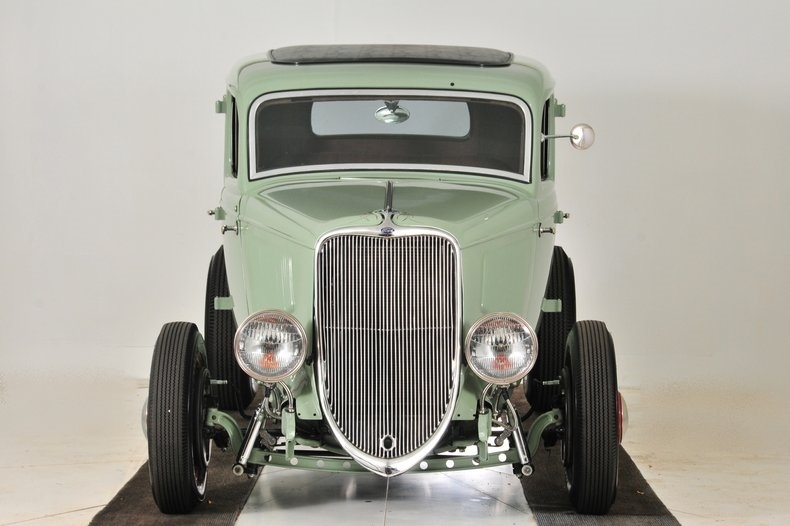 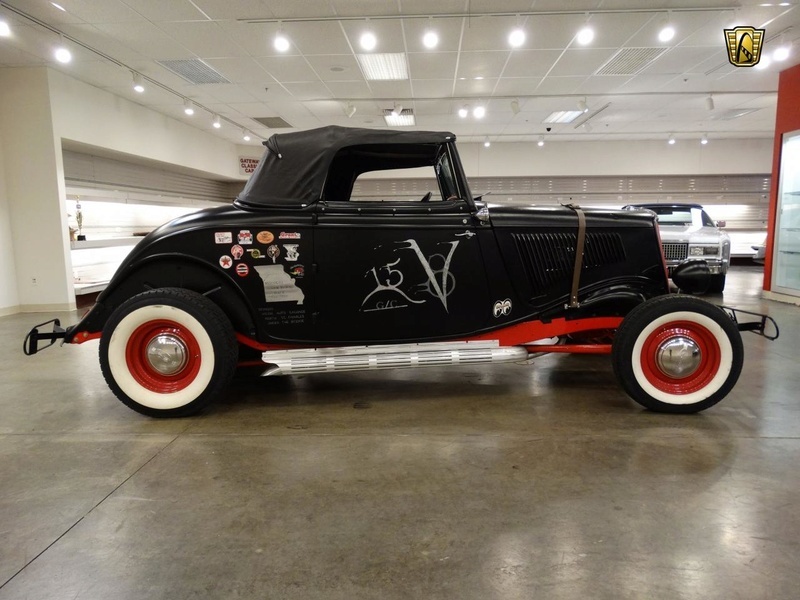 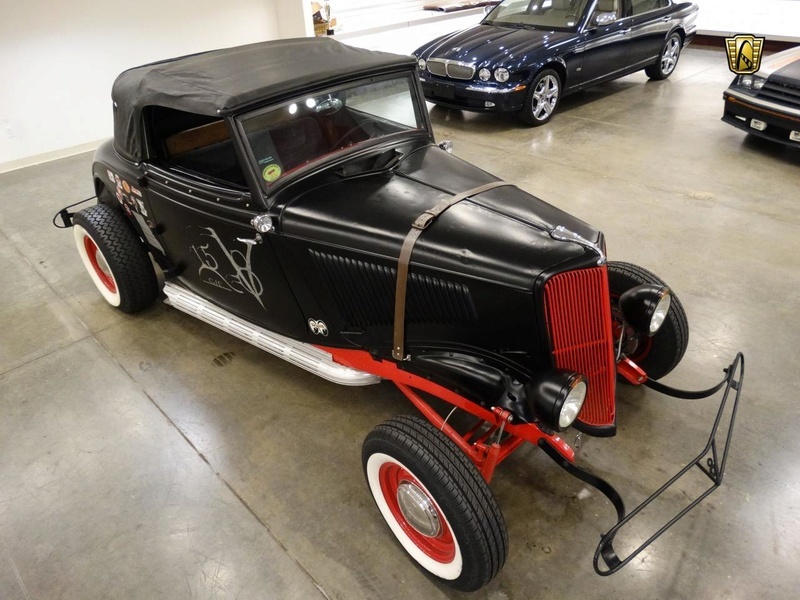 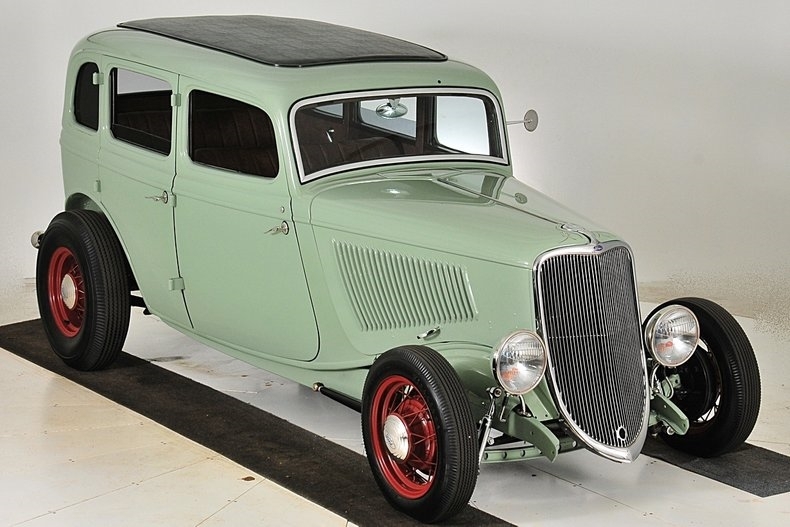 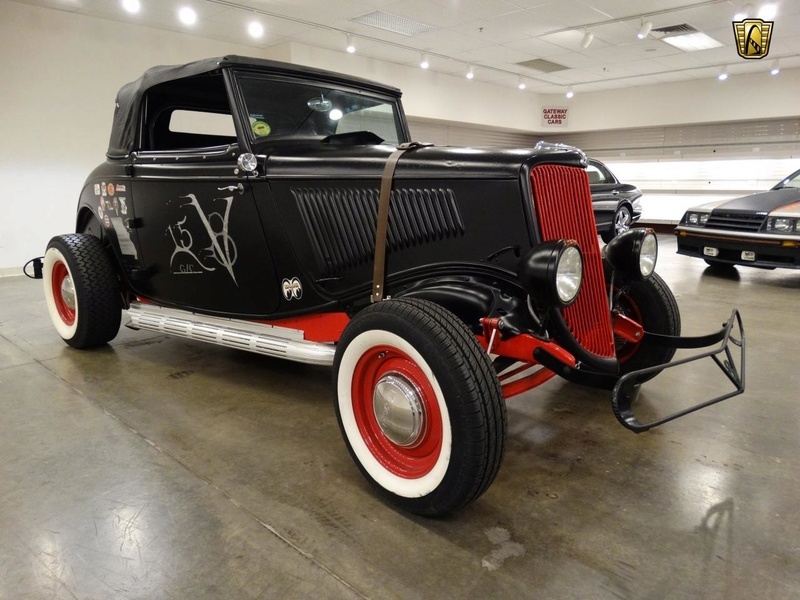 Perhaps the coolest feature of this '34 Ford is the drive train which is all Ford! 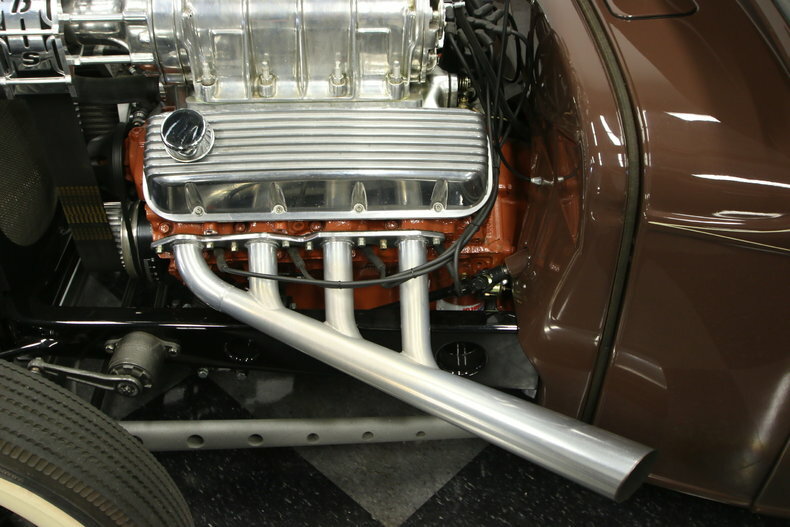 From a '66 Mustang, the car sports a 289 CID V8, a C4 automatic transmission, and a 9" Ford rear end. 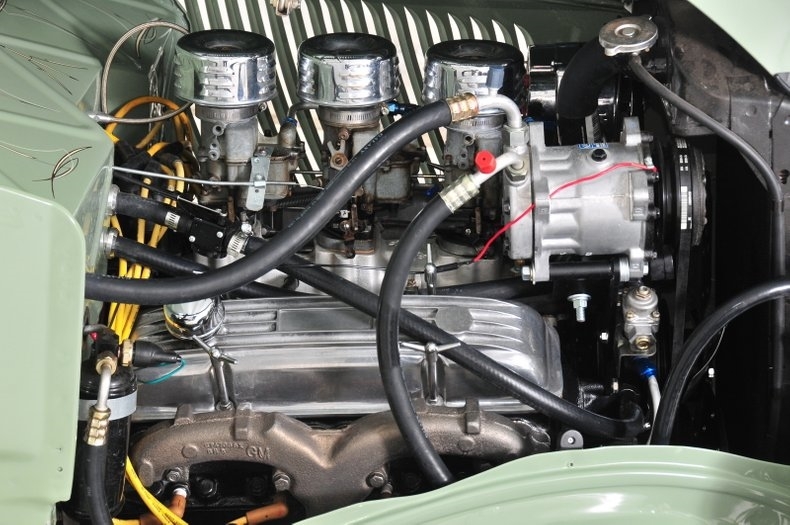 The engine and transmission have been rebuilt and have only tallied 616 miles since. 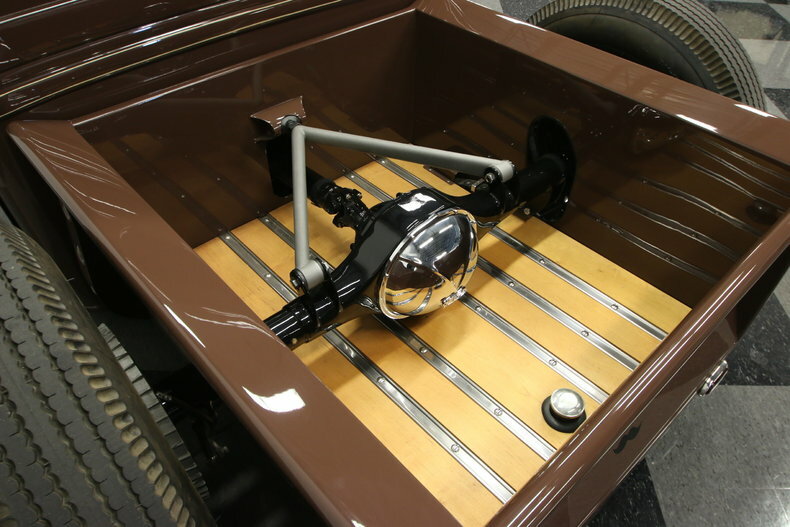 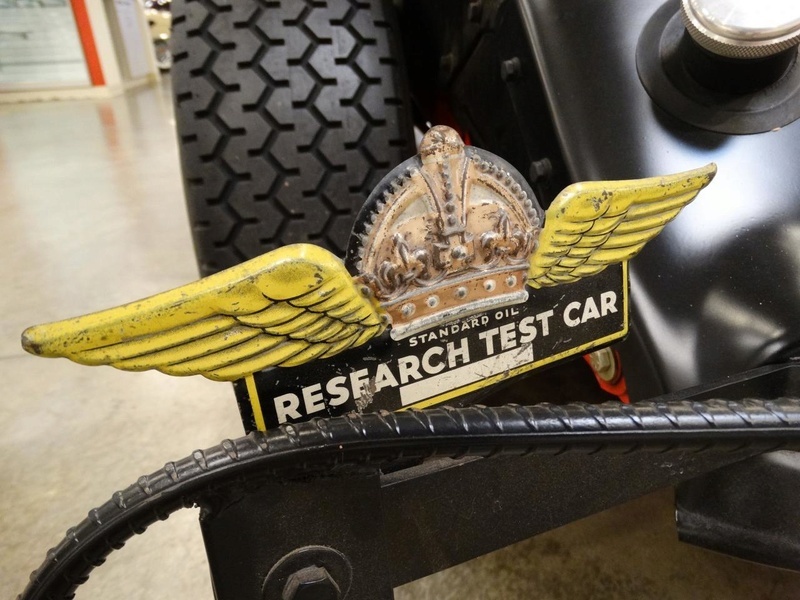 The roadster is certainly road ready, and ready to drive. 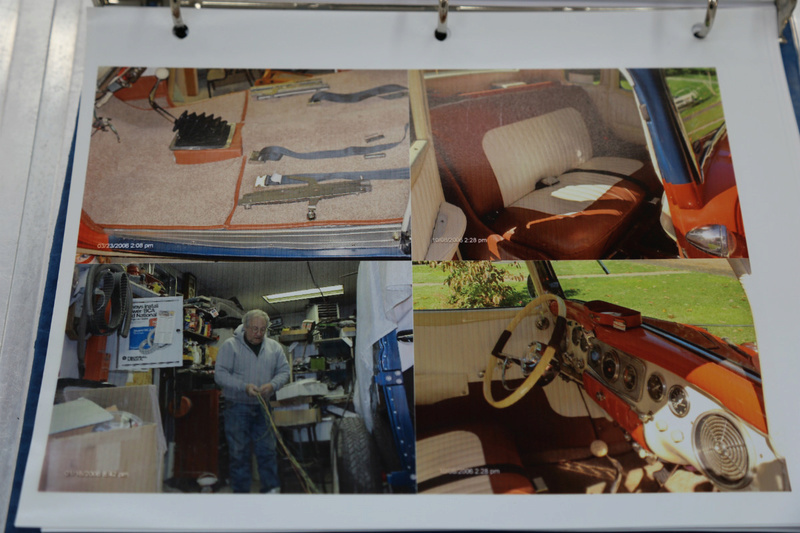 It would however make a nice vehicle to take to local car shows and tell a bit about its history. 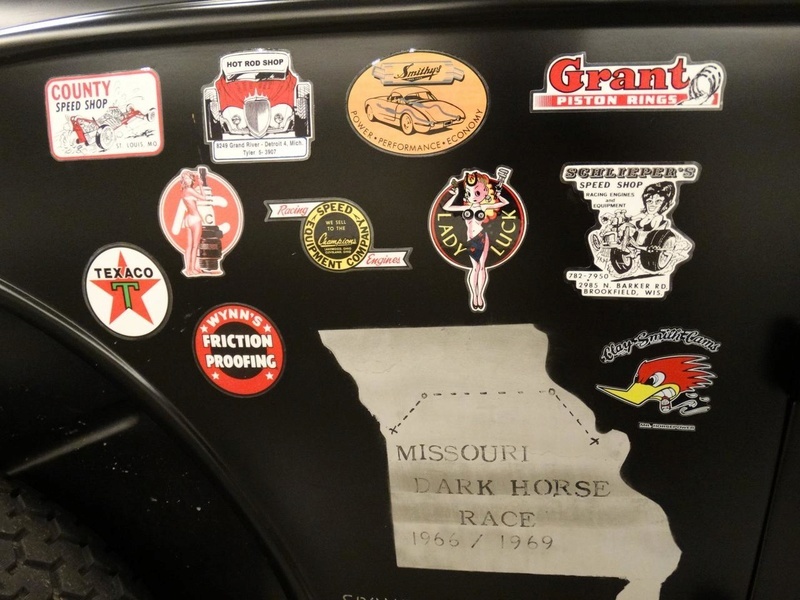 It would be also be fun to retrace the old Missouri Dark Horse Race route (under the speed limit of course). 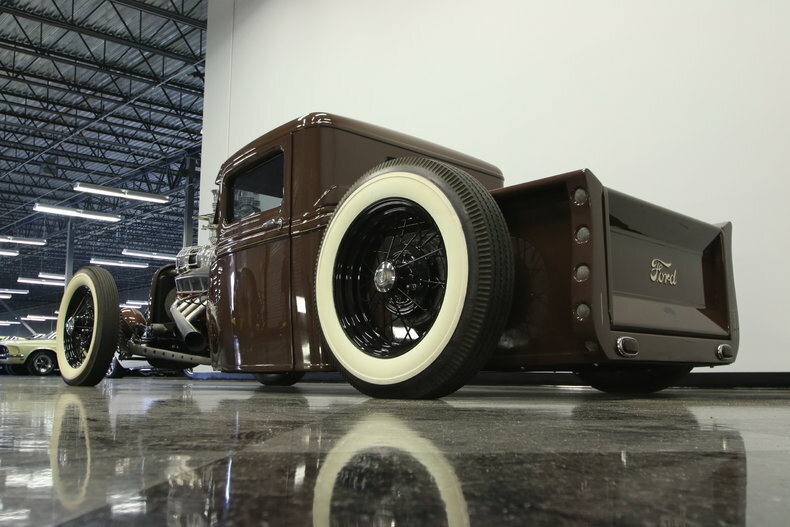 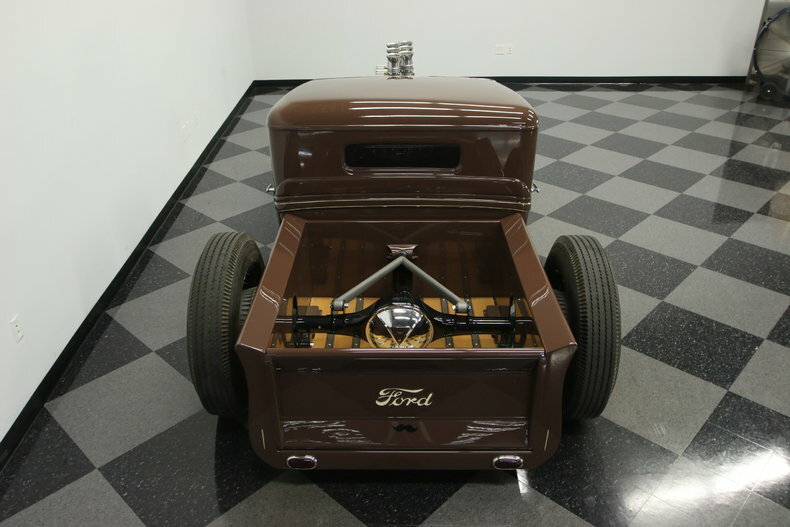 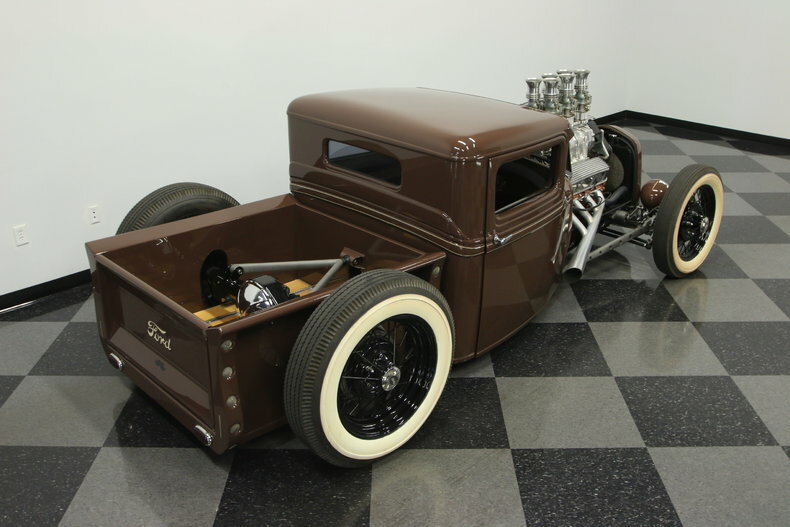 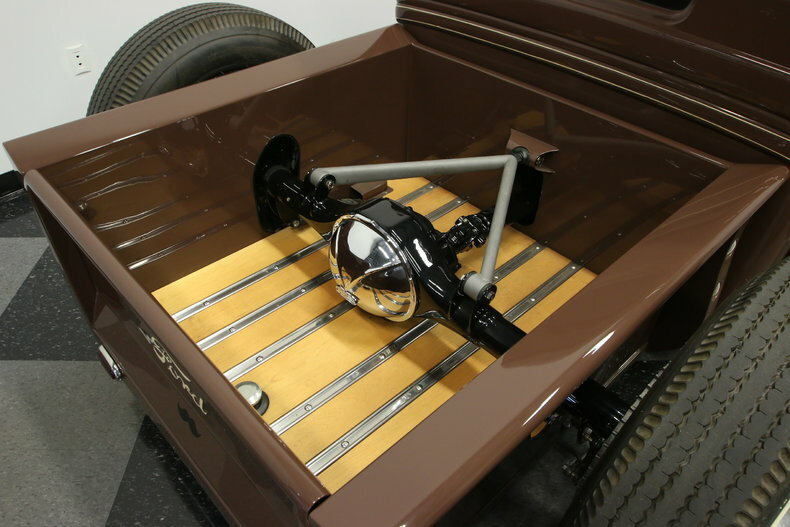 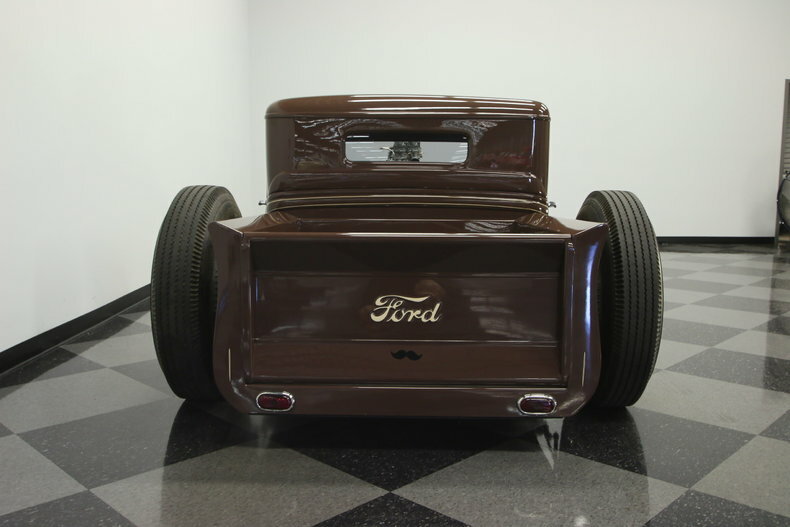 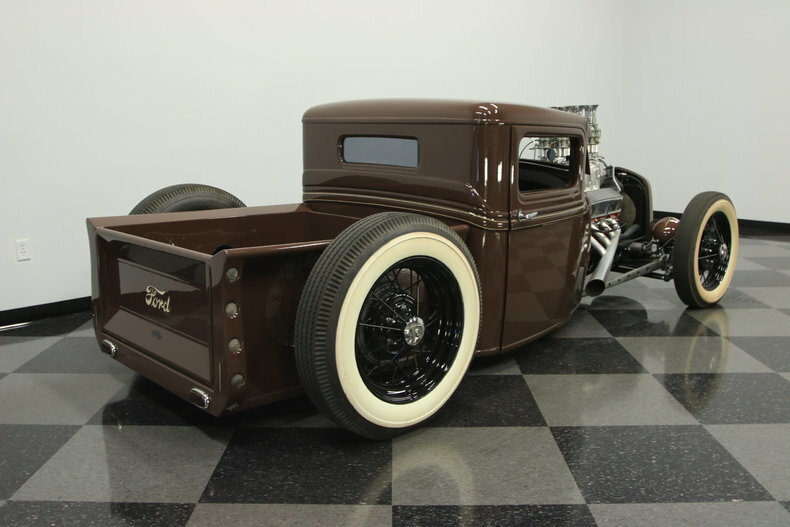 The brown color feels like a tribute to the earthy rat rod culture that inspired this design, but the high gloss modern shine of the reveals the true nature of this truck. 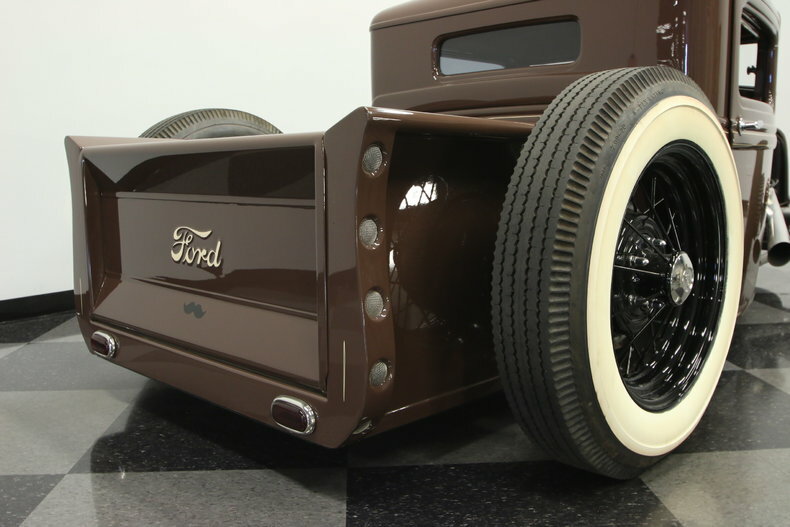 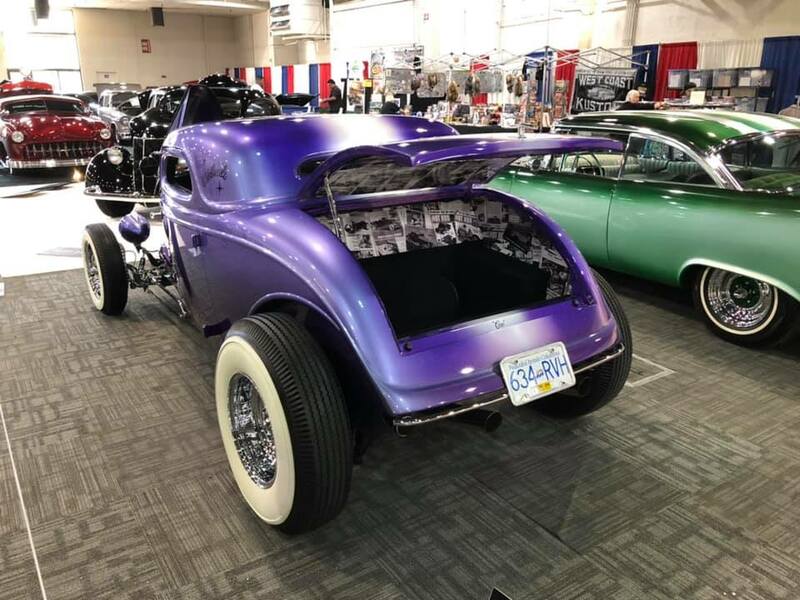 It's a custom build where no expense was spared and no compromises were taken to create the coolest street rod pickup around. 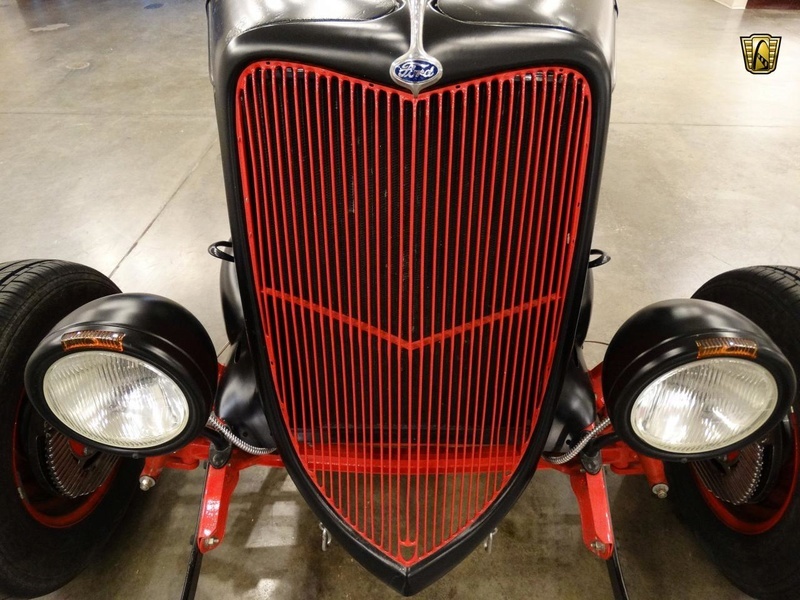 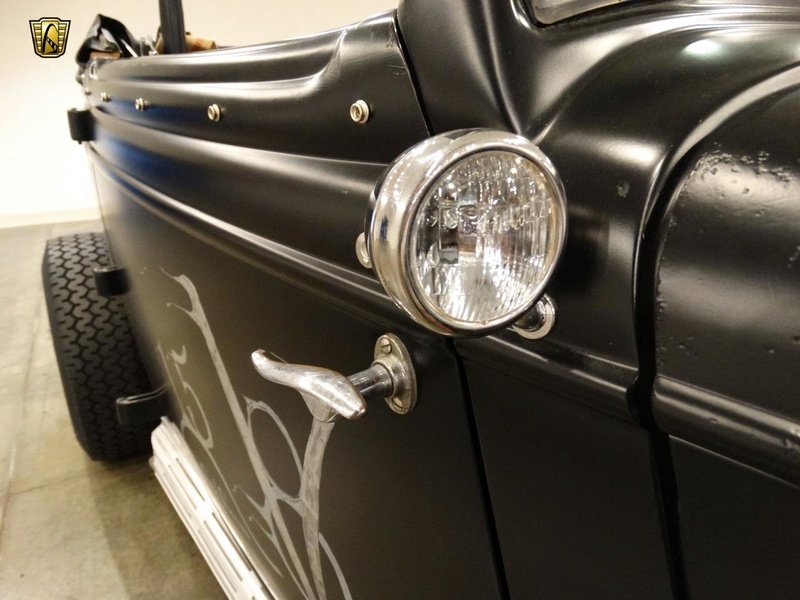 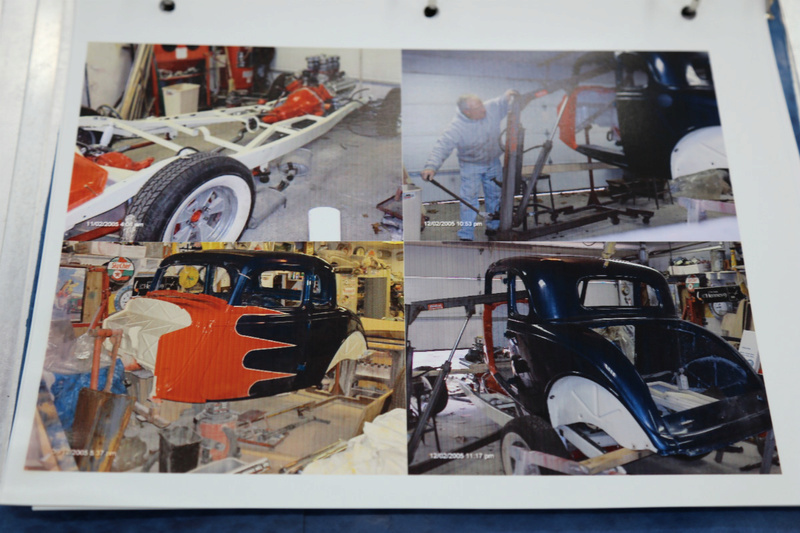 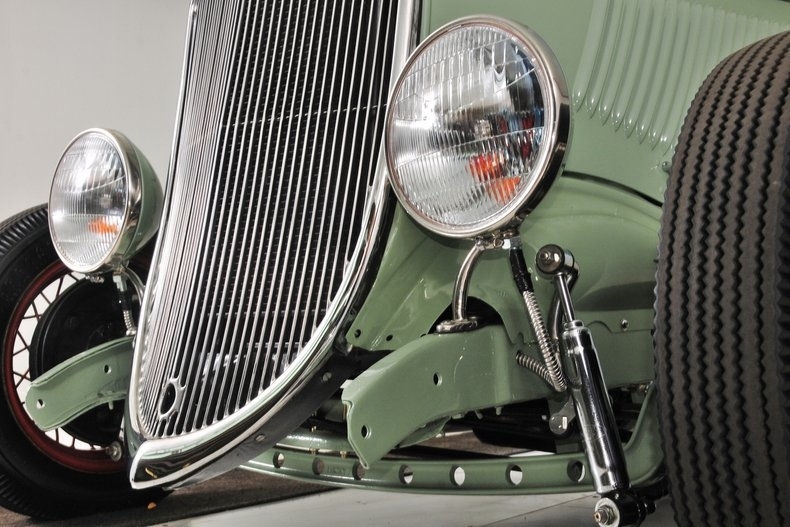 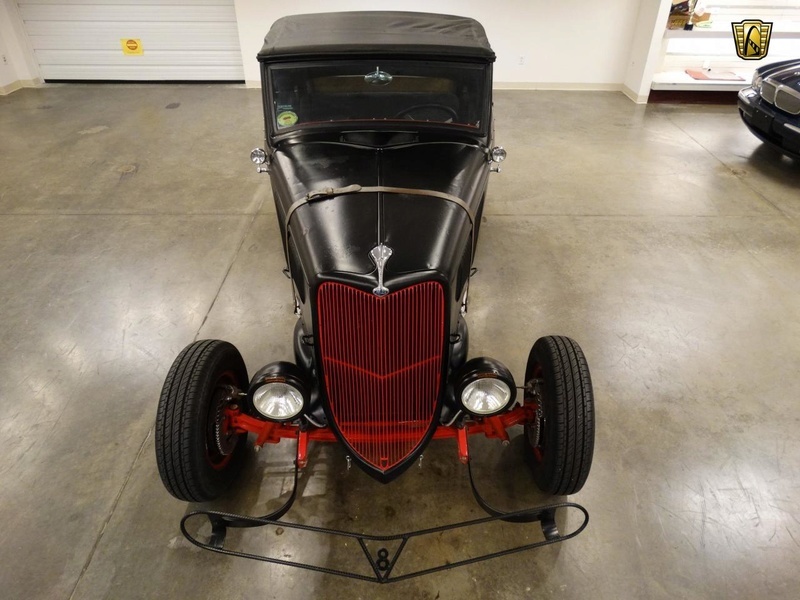 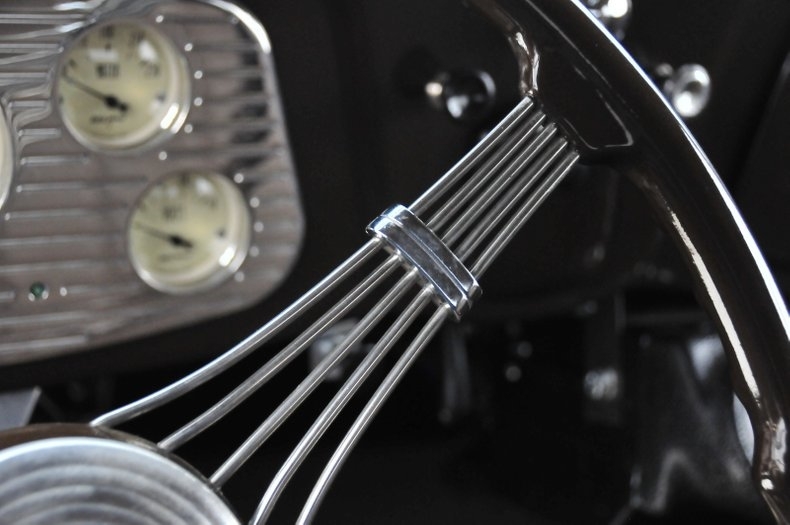 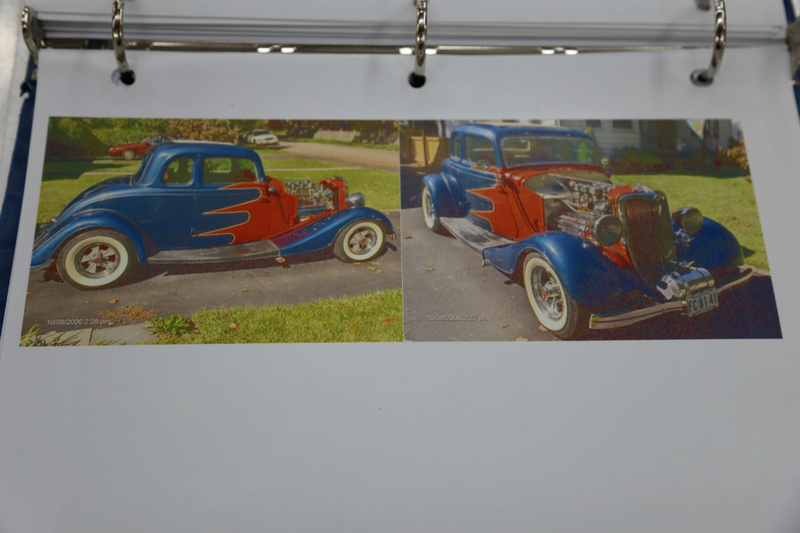 The Model A grille has bolder industrial lights and great pinstriping on top. 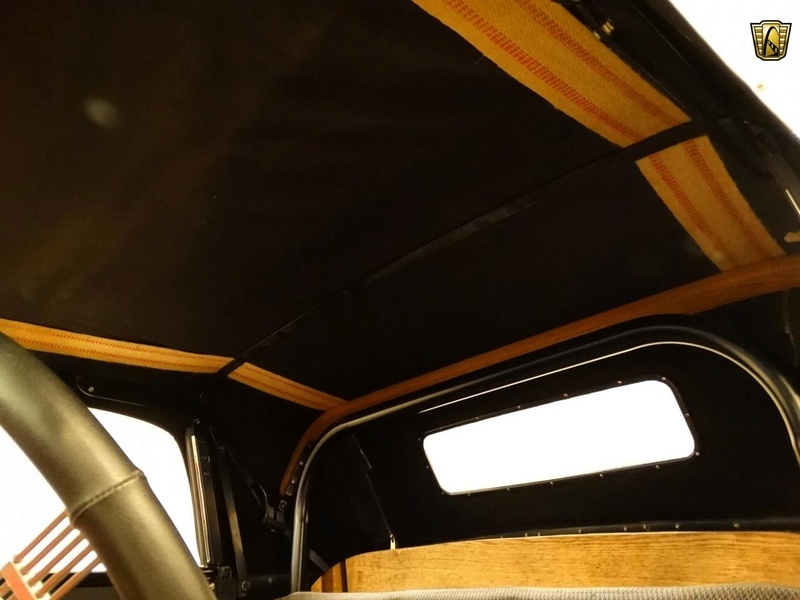 The cab has been chopped and streamlined so it looks like it could cheat the wind (there aren't even exposed door hinges.) 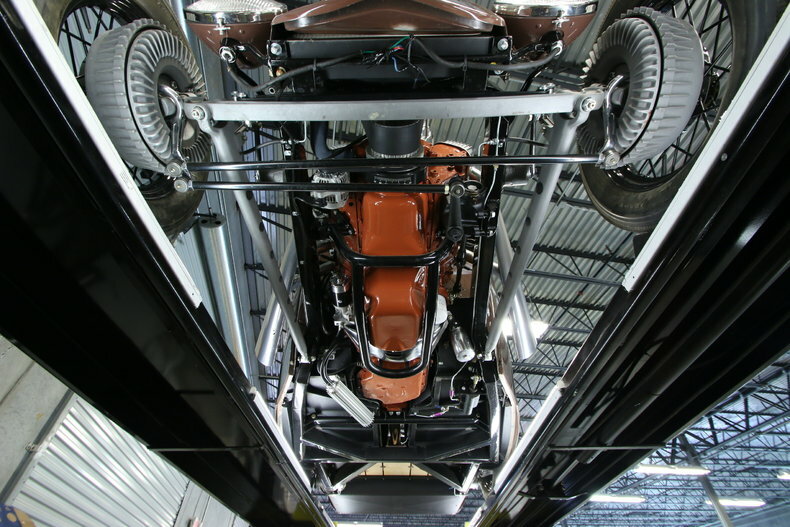 Getting this truck impossibly low to the ground means channeling the cab over the frame and running the rear suspension OVER the new maple wood bed so all the world can see it. 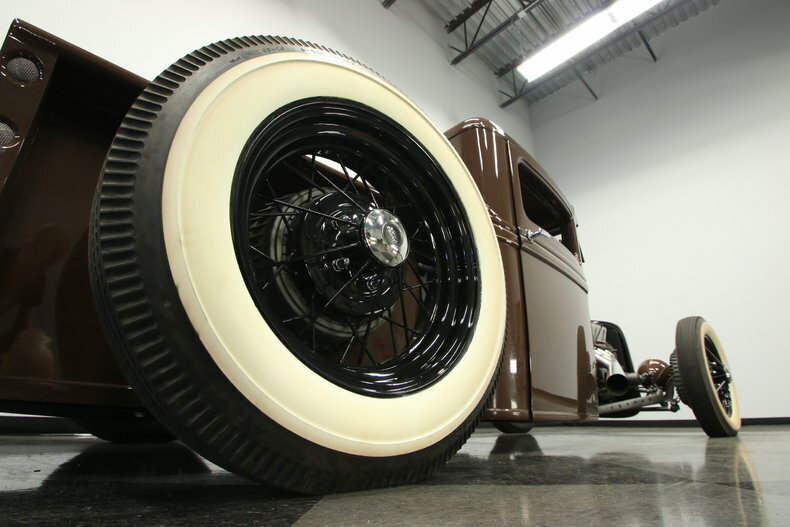 The finishing touch is keeping a set of the old school wire wheels and whitewalls so everyone understands how truly low you can go. 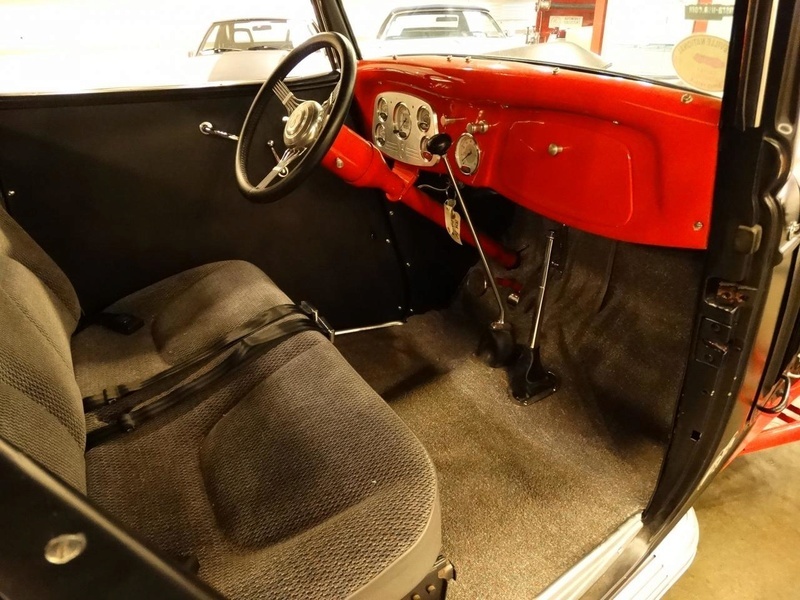 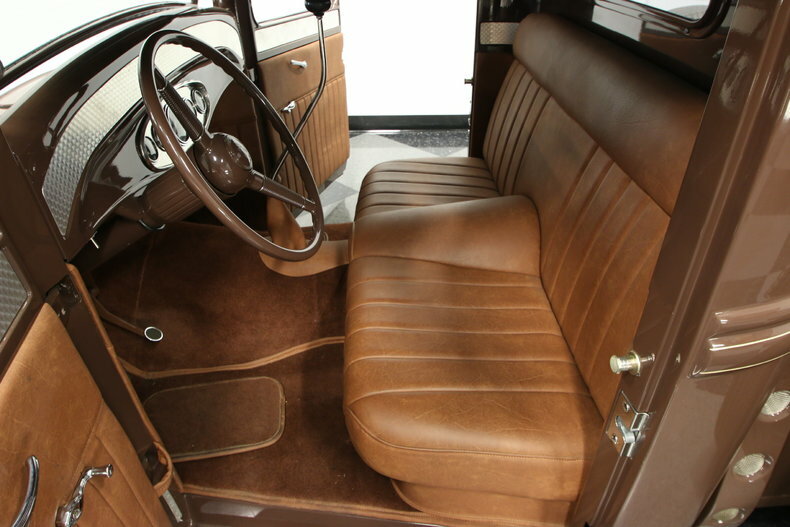 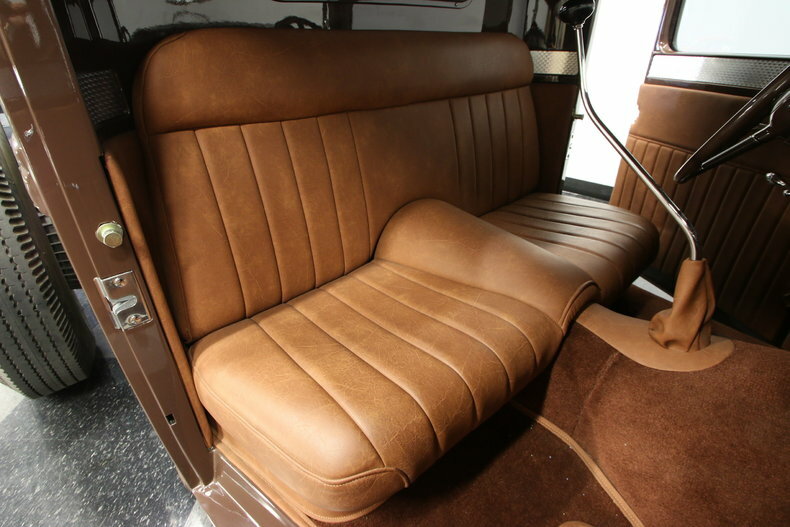 The interior has been just as carefully crafted to be comfortable without betraying the minimalist attitude (heck, the power windows are actually operated through the roll-up style-cranks!) 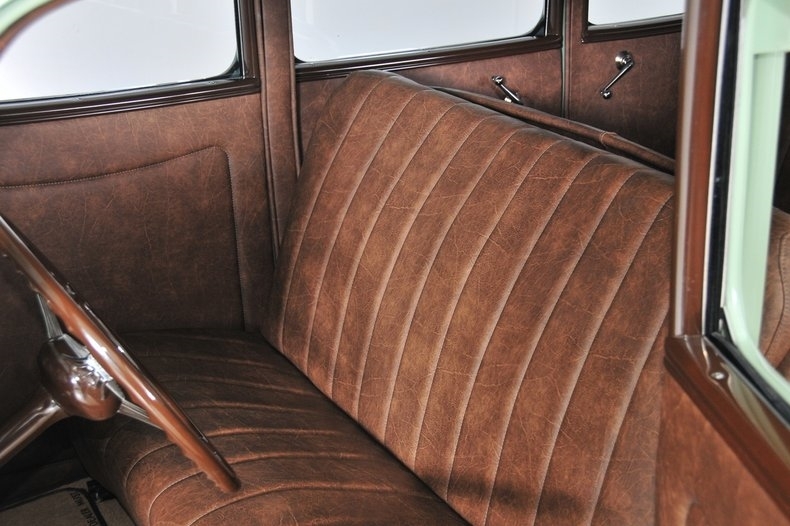 The brown bench is built to have a durable appearance, but feels as good as a quality leather should. 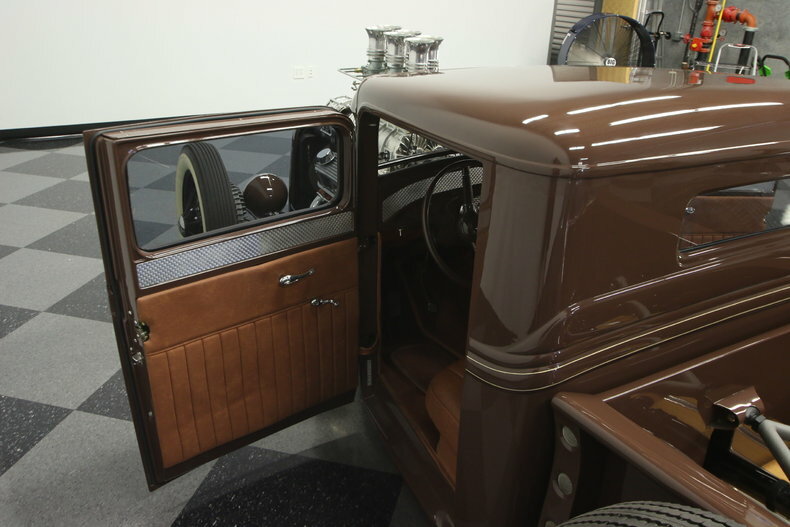 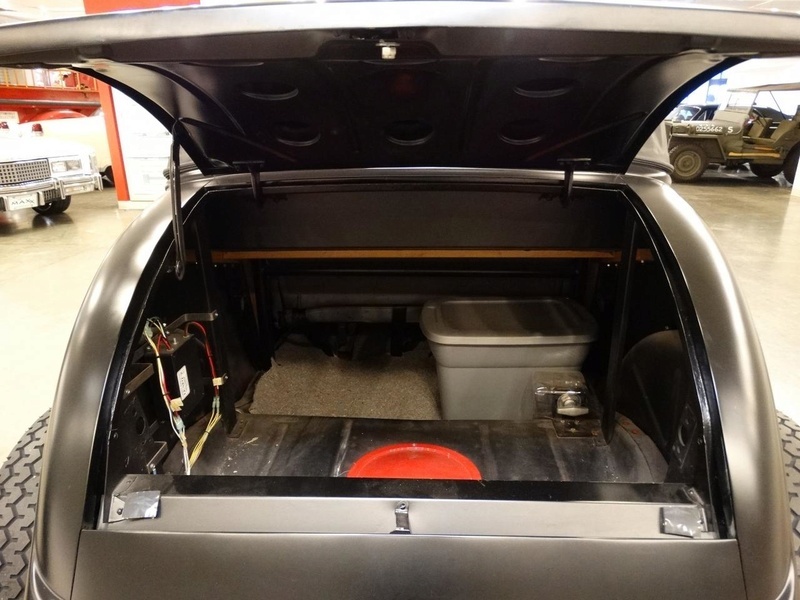 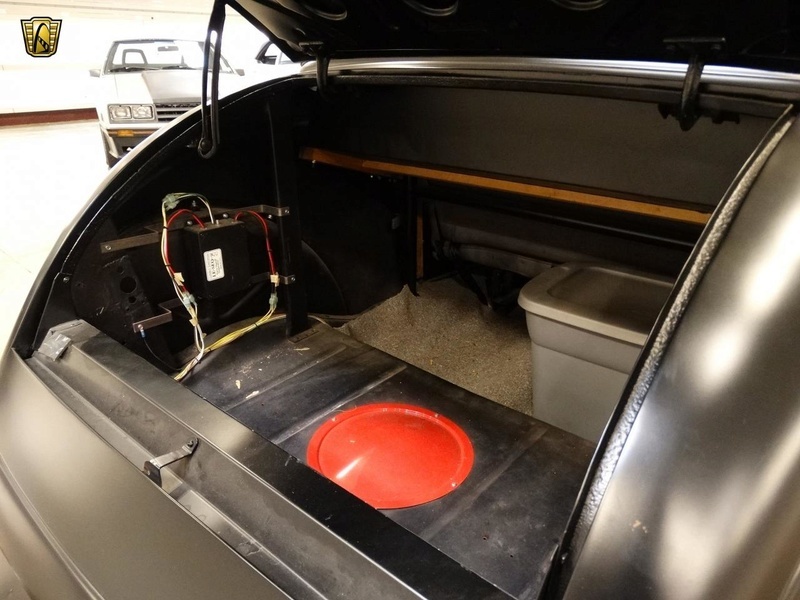 This matches the shift boot, door panels, carpet piping, and headliner to remind you just how much thoughtfulness went into this build. 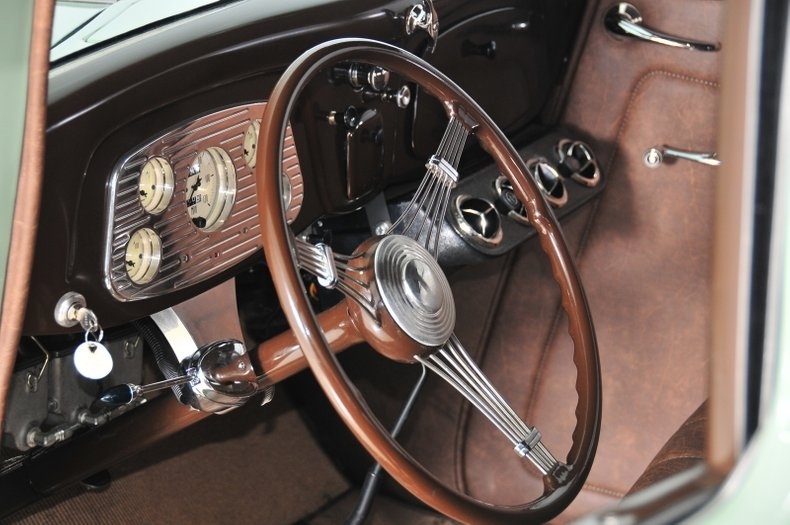 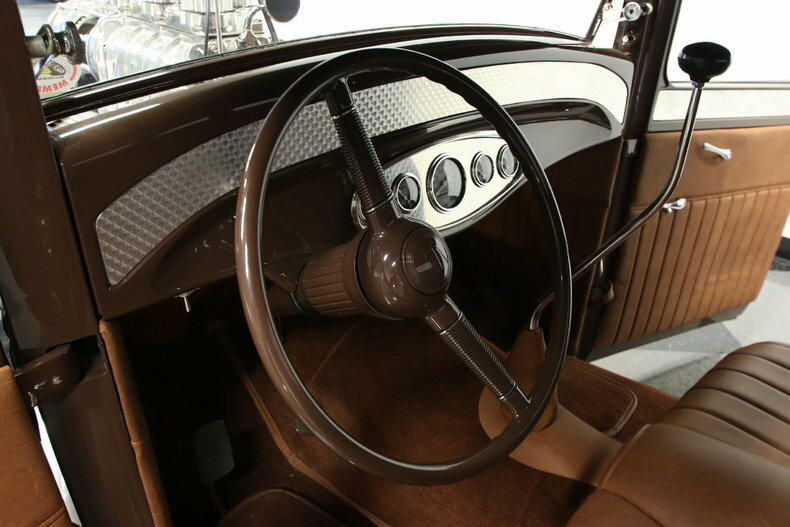 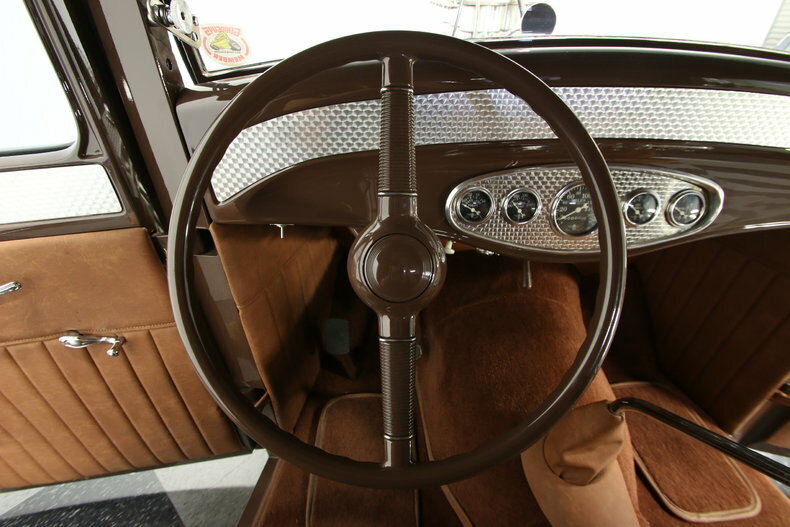 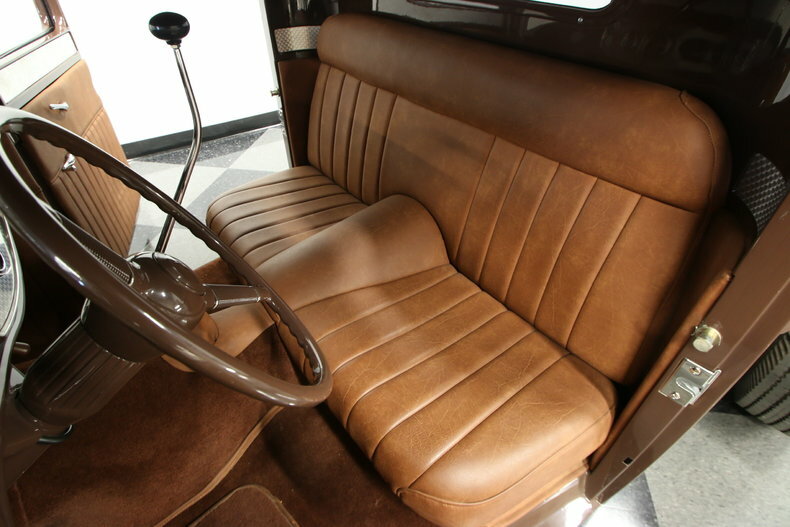 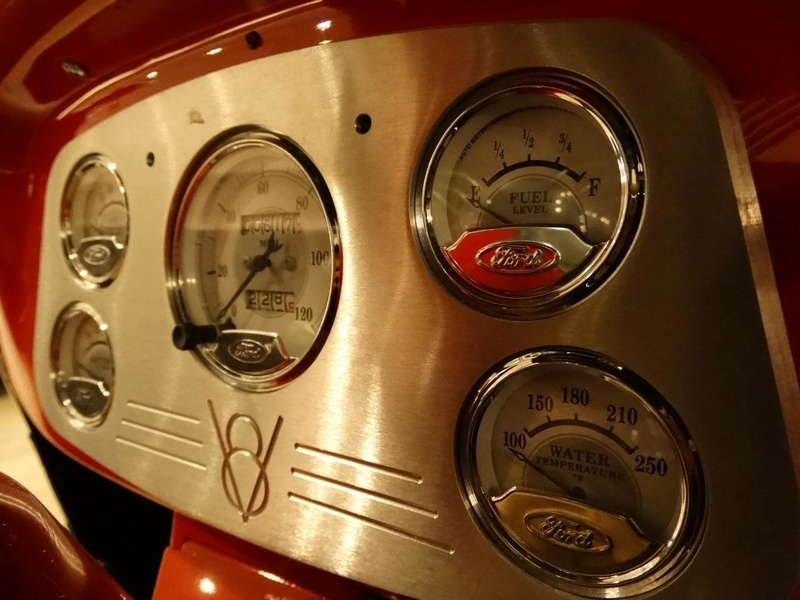 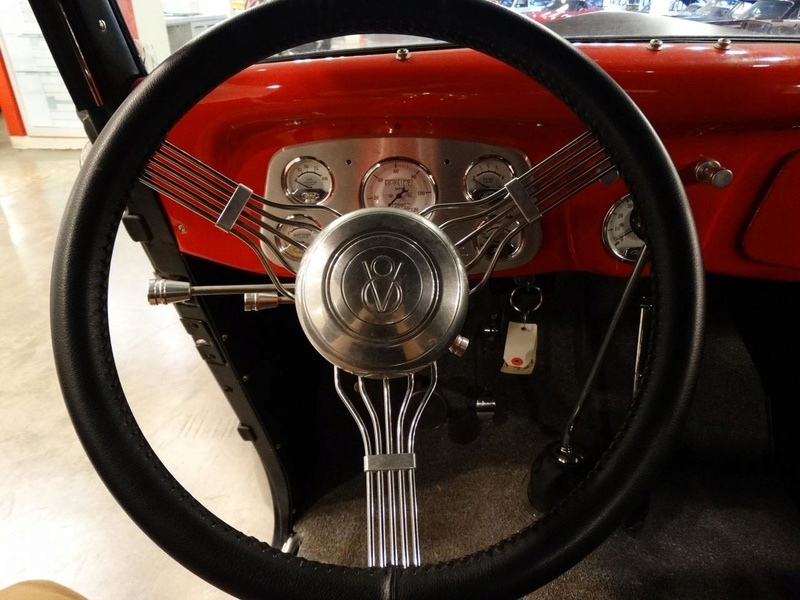 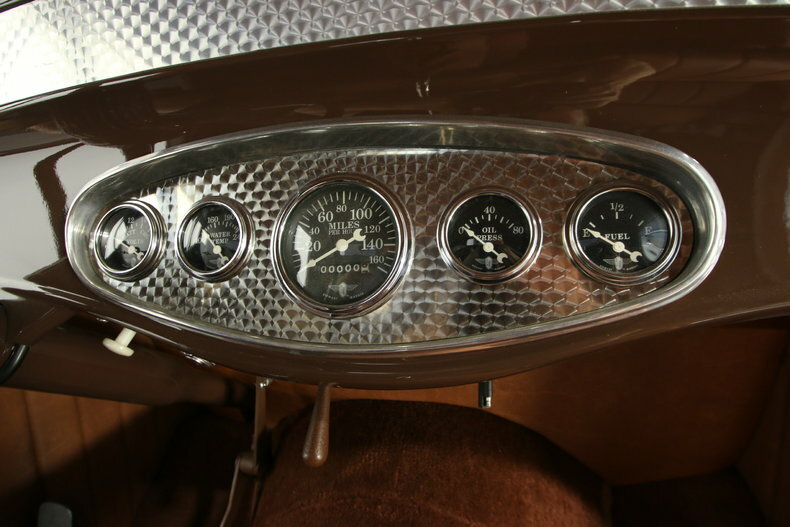 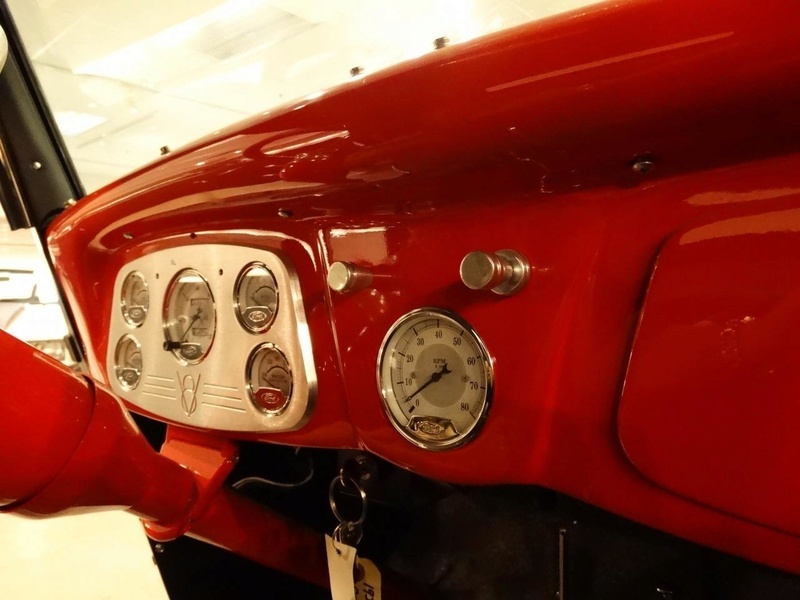 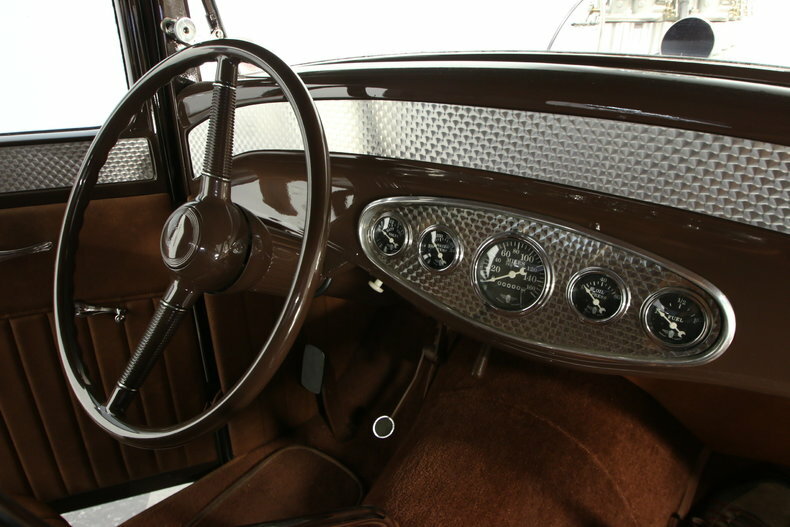 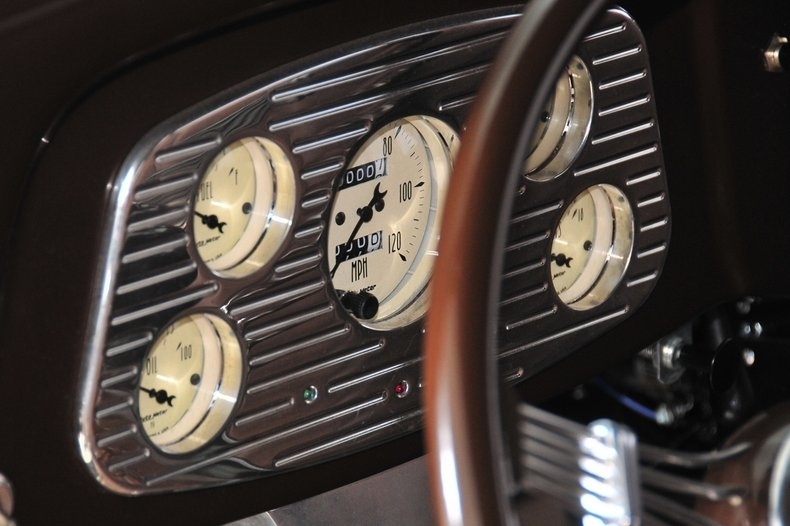 When you slip behind the wheel, you see the bit of flash provided by the machine-turned aluminum panel that houses the Stewart Warner gauges and the matching wraparound accent panel. 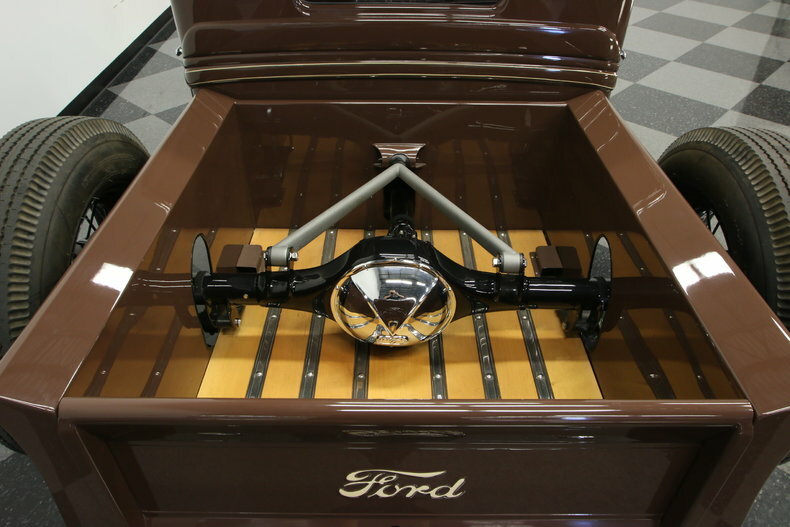 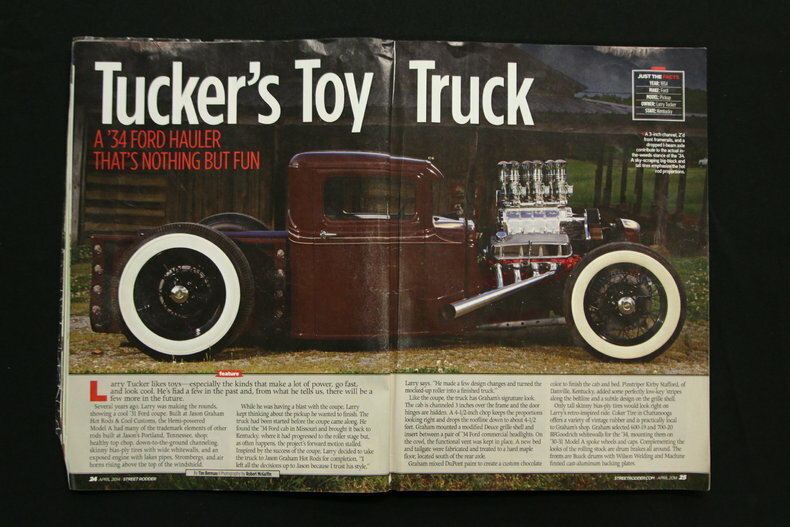 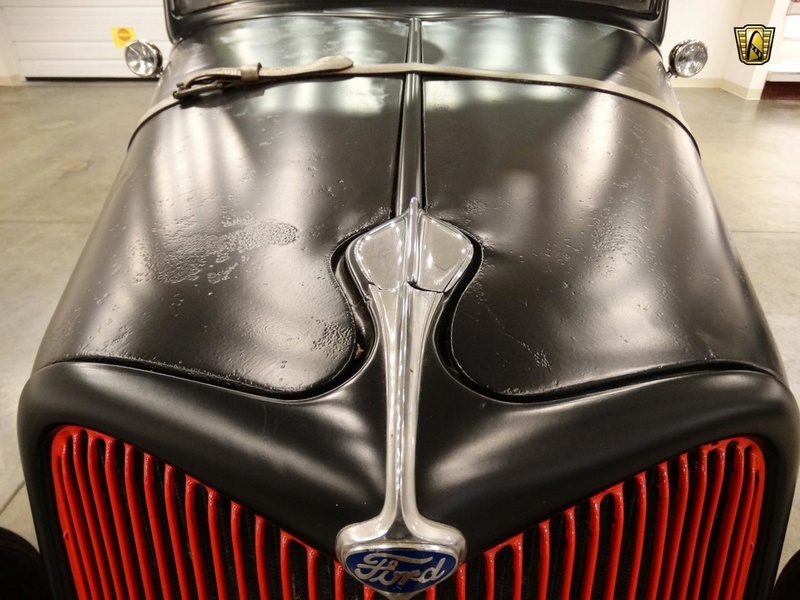 This it true rodding fun as you grab the original Ford steering wheel and the ultra tall Gennie shifter. 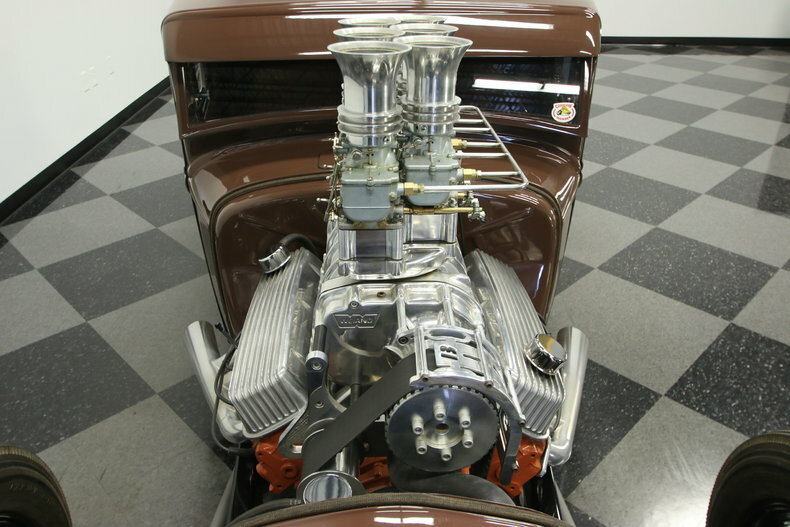 We know you've been staring at that motor, and so will everyone else. 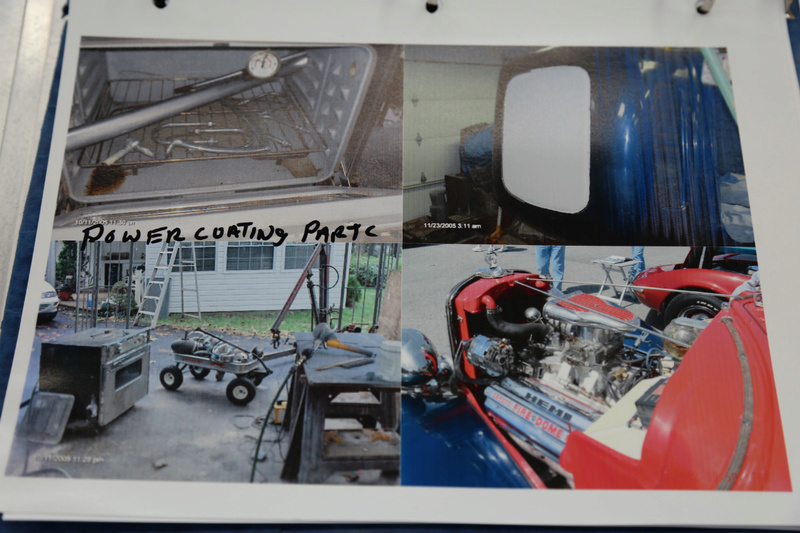 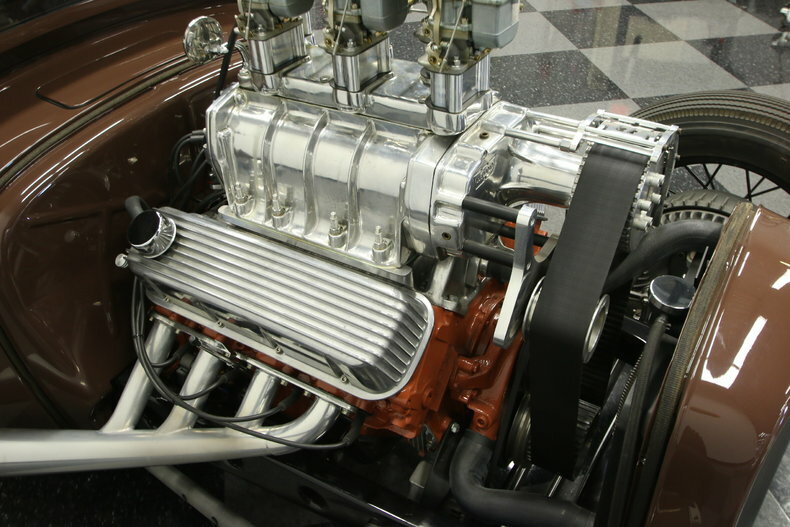 It's a 454 cubic-inch Chevy V8 with a bored .30 over kit for a grand total of a monster 486 ci displacement. 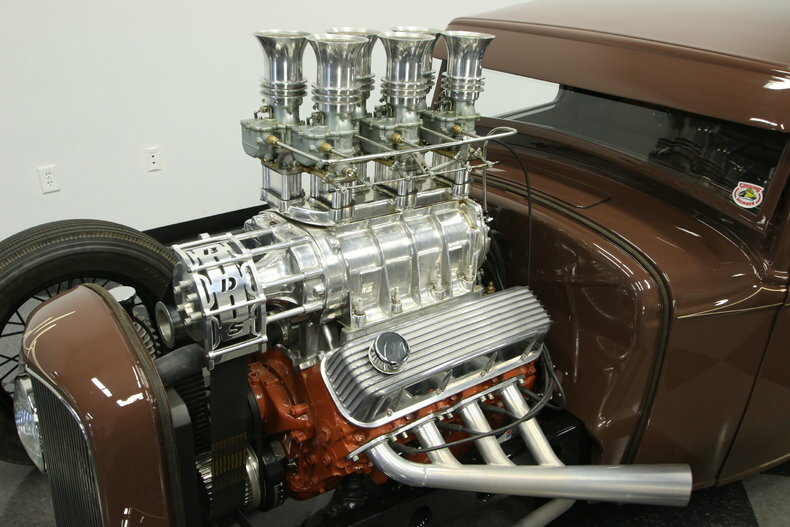 But that wasn't enough so there's an 8-71 Weiand Supercharger placed on top. 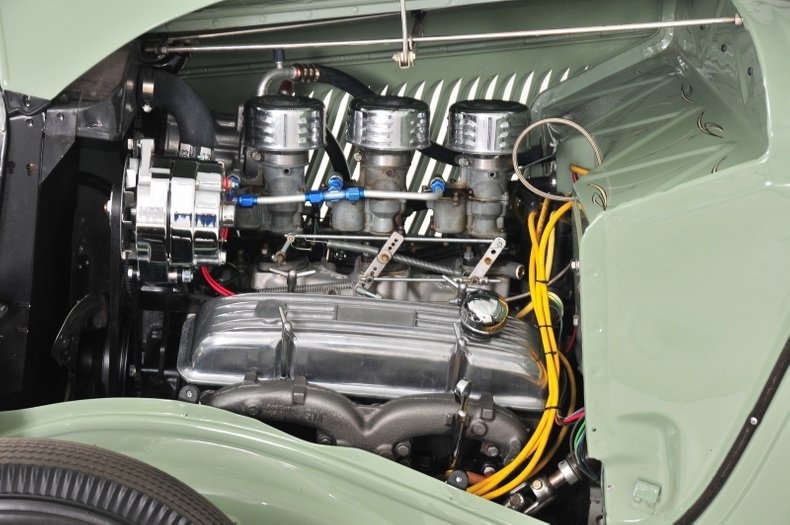 Then get a six-pack of Stromberg carbs boldly sitting on top. 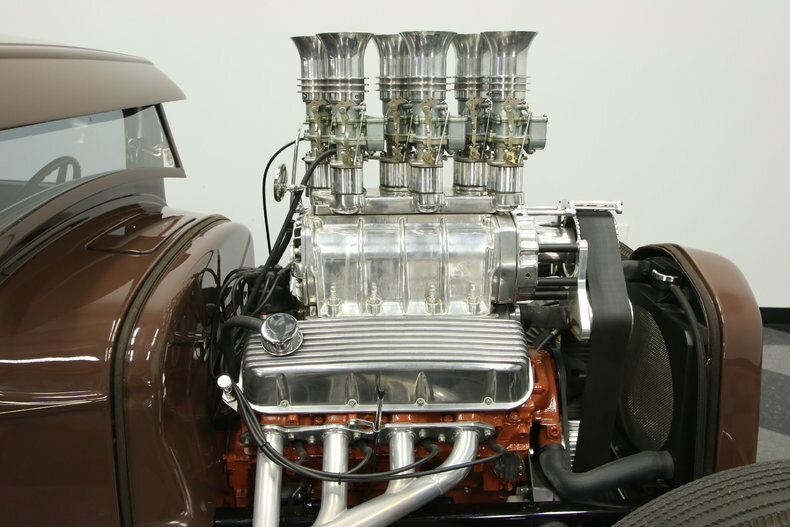 That's how you produce 600 hp. 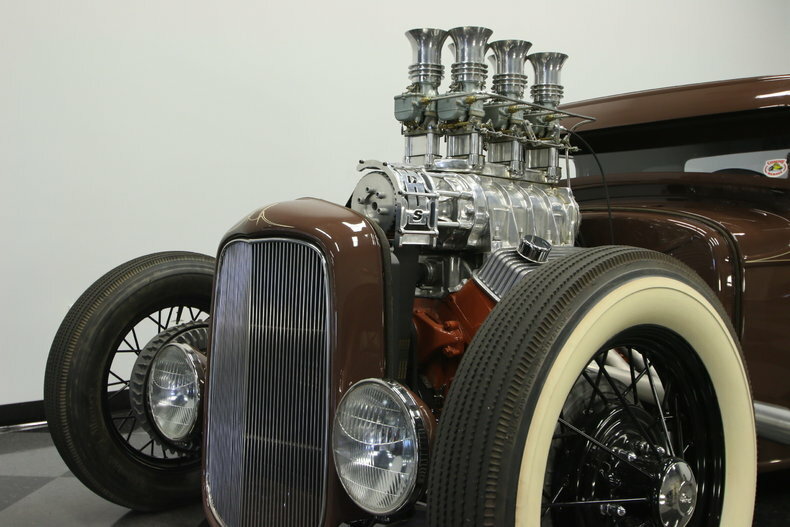 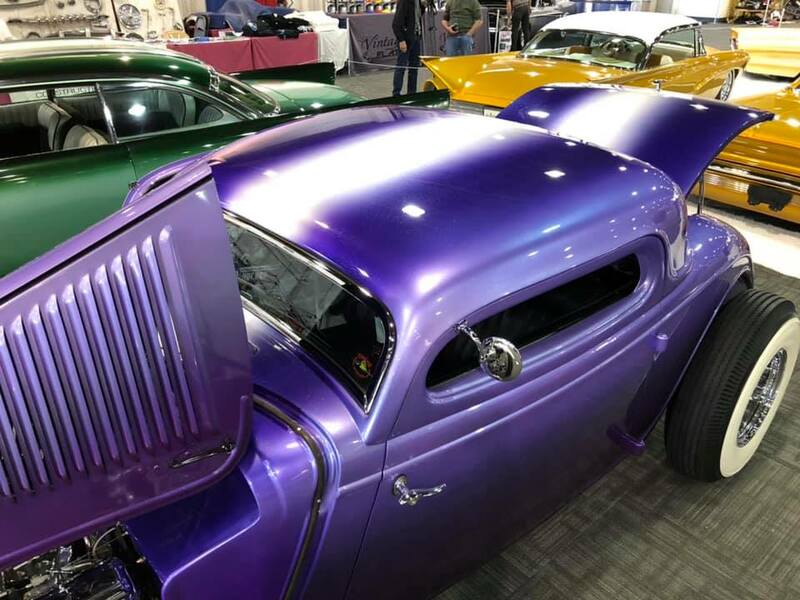 But thanks to the shine of the supercharger, valve covers, Muroc stacks, and so much more, you might not be able to unleash the full force, because of the huge crowd this custom V8 instantly attracts. 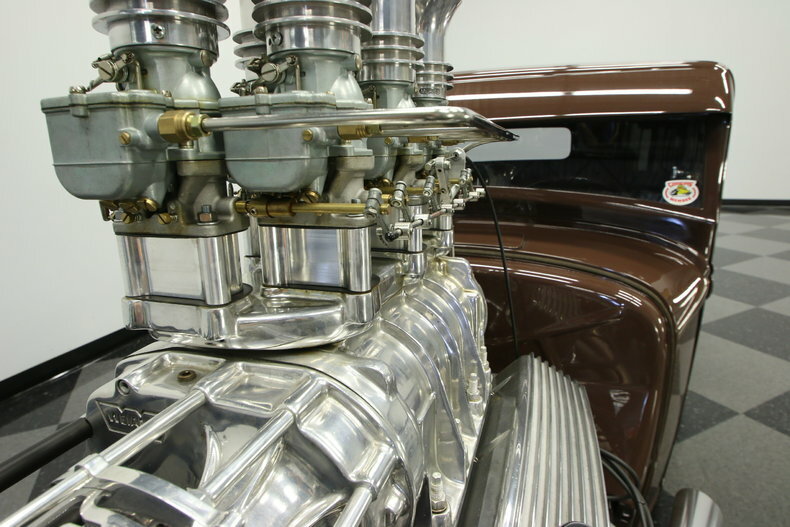 Then again, everyone will back away the moment you fire up the motor, and those straight pipes give a thunderous sound. 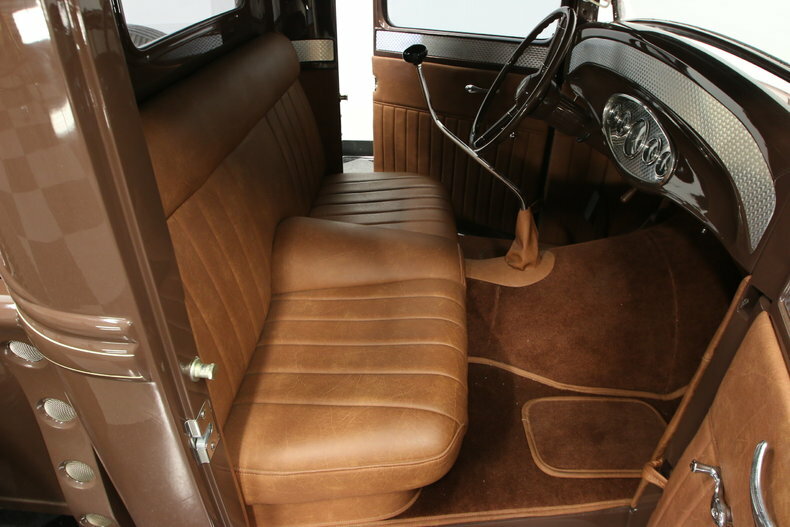 It's good that you'll clear a path, because the TH400 three-speed automatic and Ford 9-inch rare are stout enough to handle all the power. 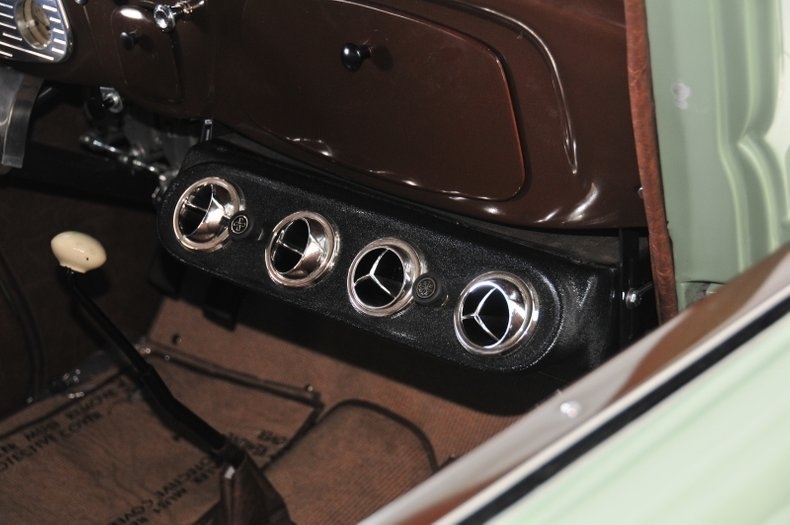 is immediately obvious at first sight. 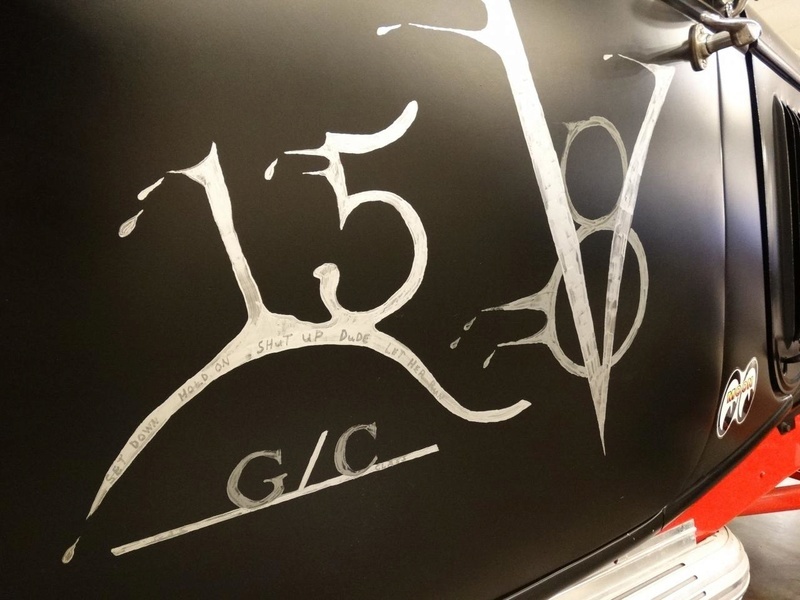 It has been hand pinstriped. 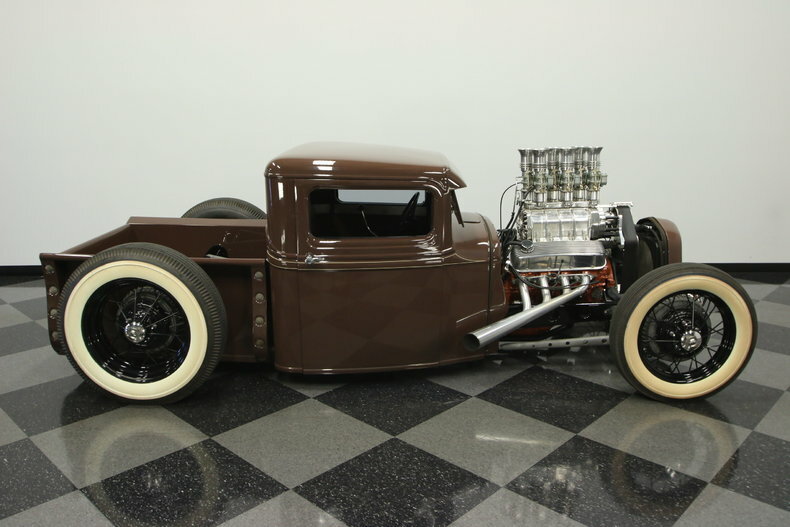 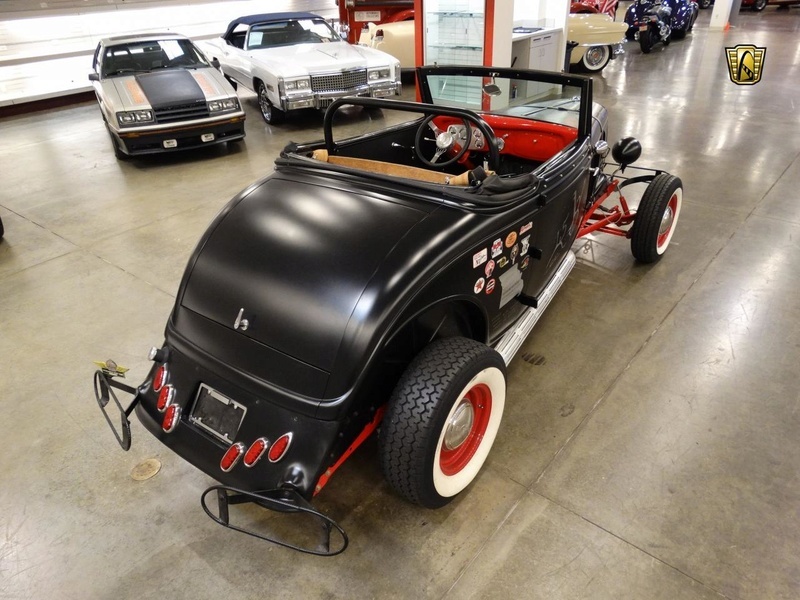 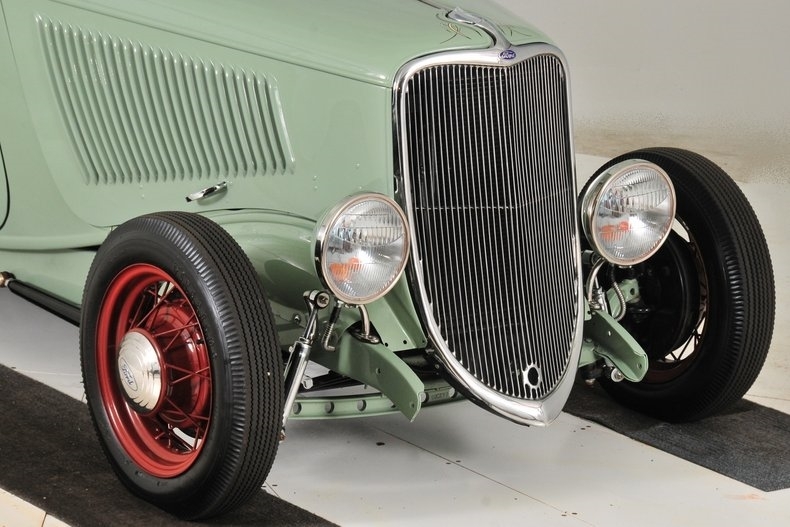 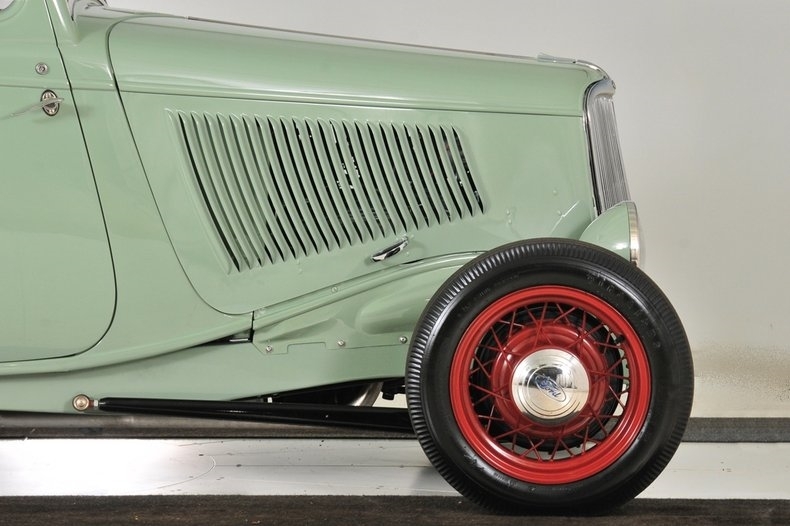 True to the nostalgic hot rod look by being bumperless, fenderless and no running boards. 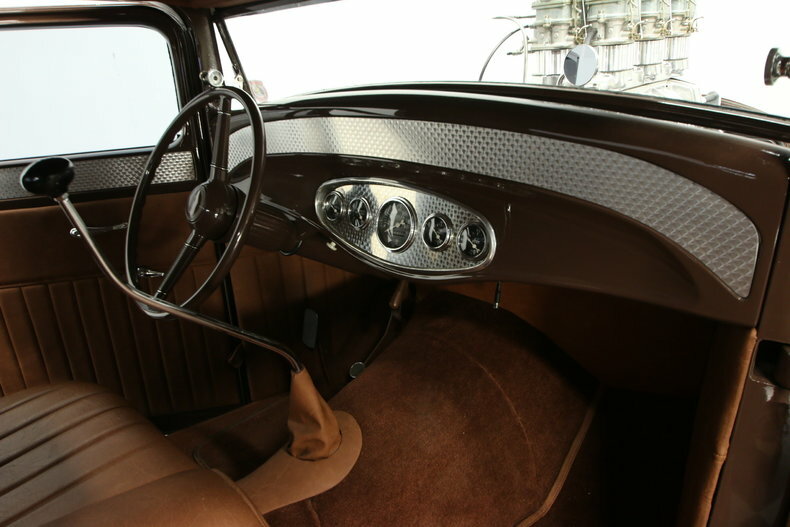 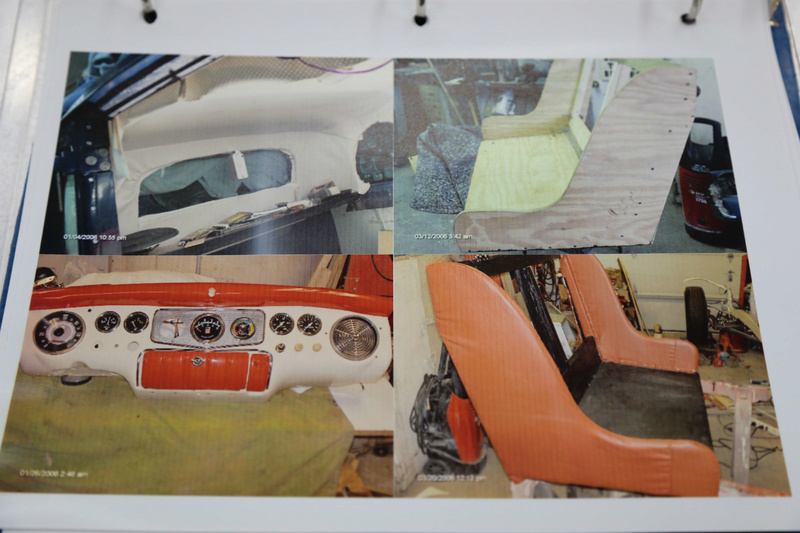 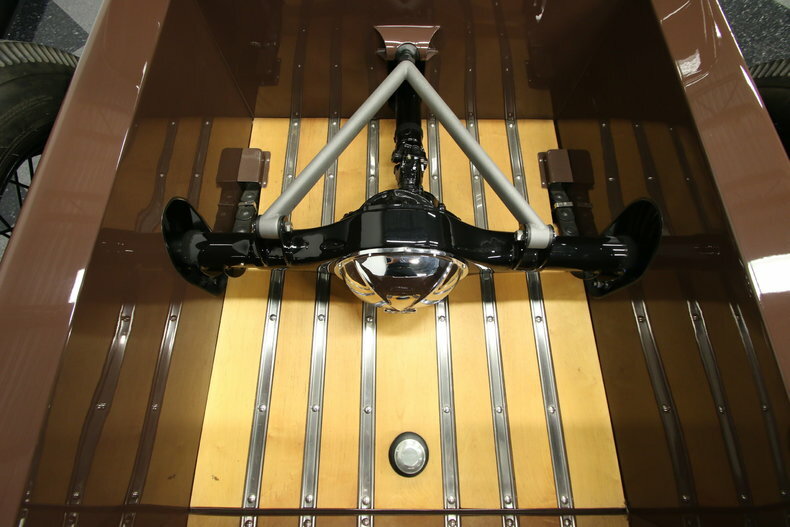 Other original features are the chrome grill, metal hood with louvered sides, chrome door handles, headlamps and taillights. 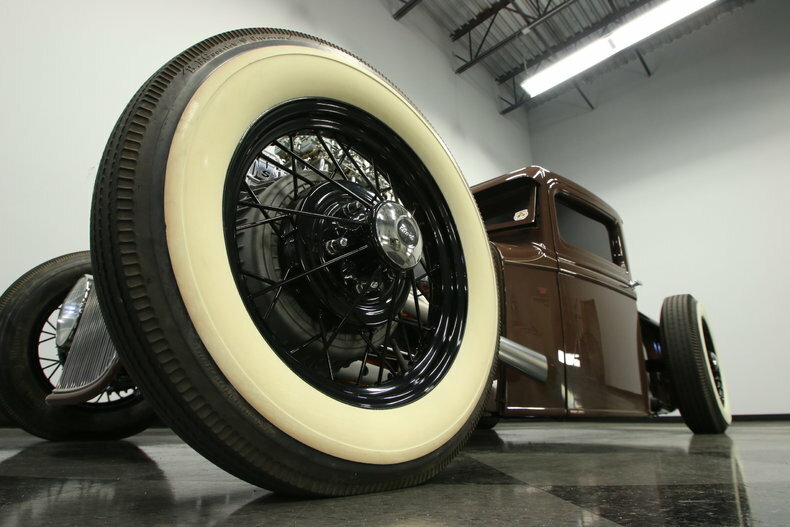 The original style wire wheels are painted a dark, rich brown and they complement the car perfectly. 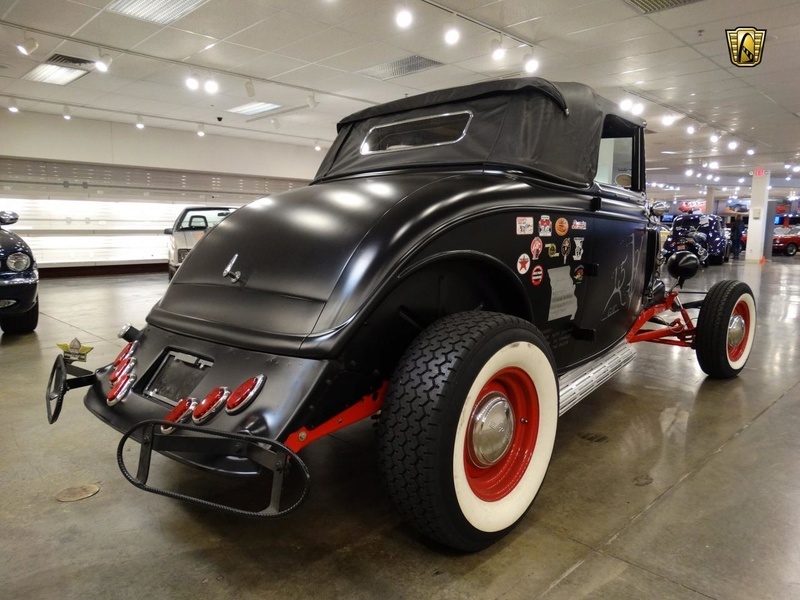 Reproduction black wall tires, bigger in back. 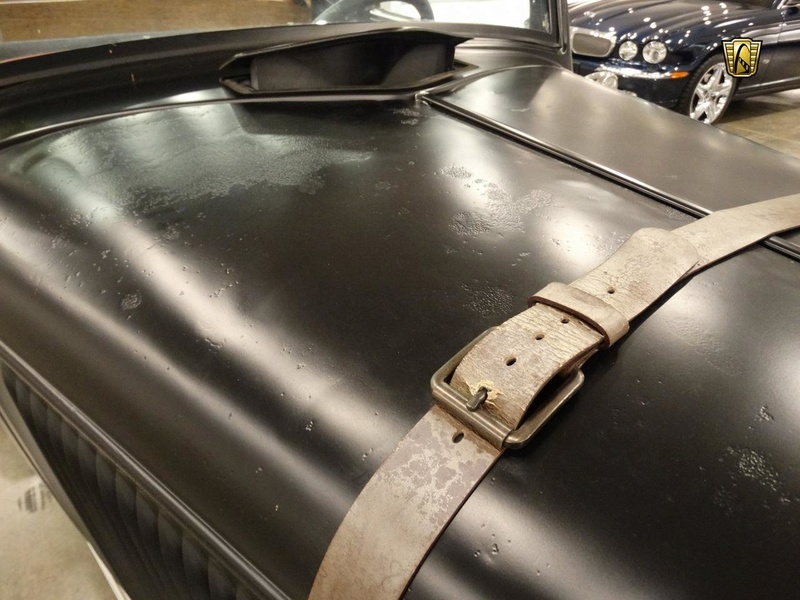 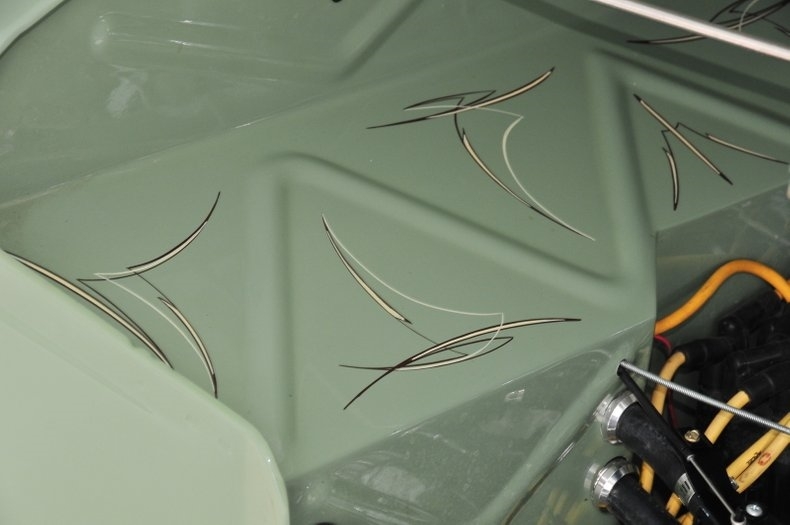 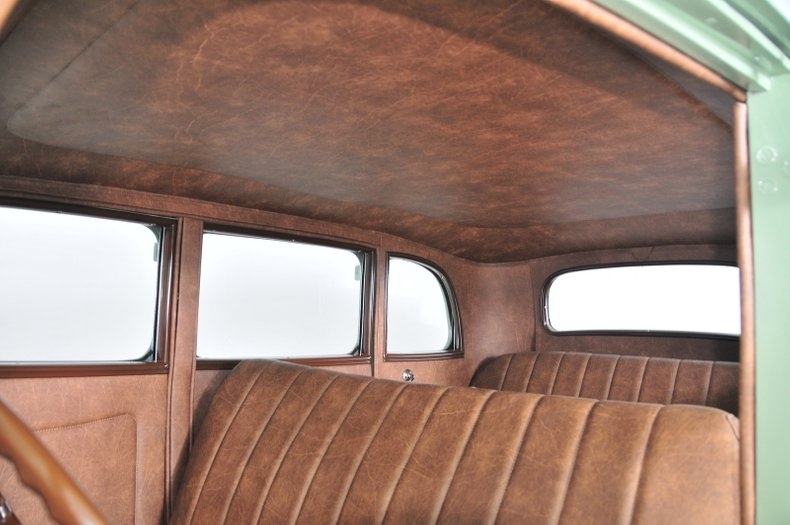 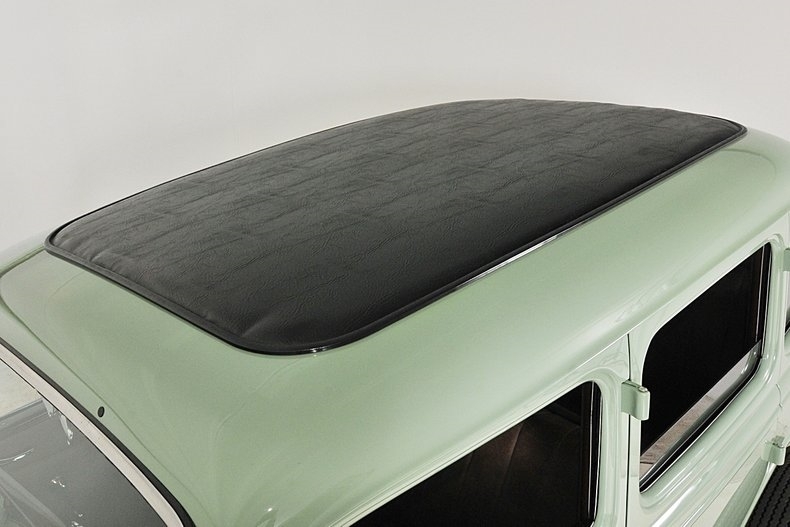 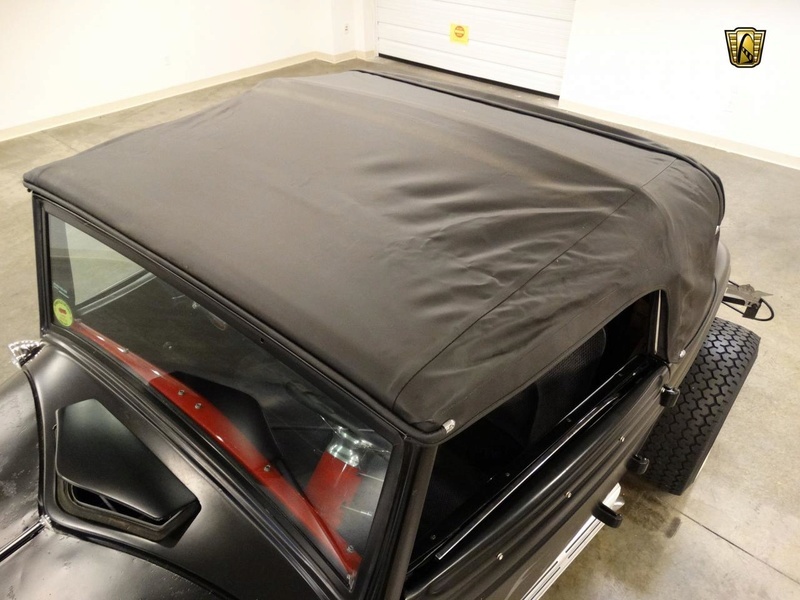 The vinyl roof insert is new. 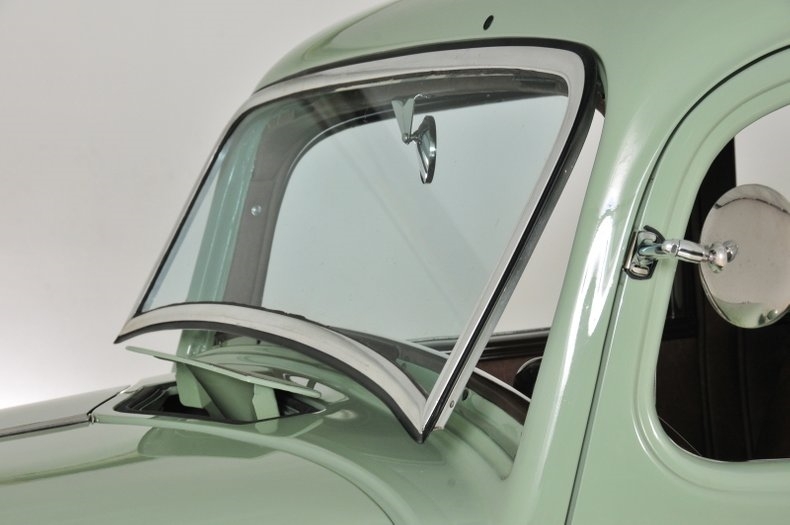 All new tinted glass.